Lee Pass TH: 6,082 ft.
Angels Landing : 5,790 ft. It's quite a blessing when you're able to enjoy time out in the wilderness with friends. 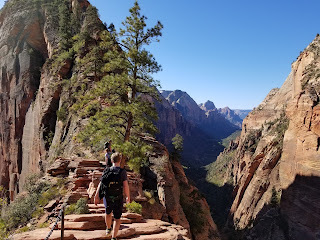 This year marked the third triennial backpacking trip I've been able to make with my friends Matt and Ken. In 2011 and in 2014 we made our way out to Yosemite and enjoyed hikes in numerous areas of that wonderful park. This year we laid out a list of ideas of hoping to try something different. Amongst ideas, the Teton Traverse and the Zion Traverse came out as our finalists. Both would have promised amazing views and plenty of good trail miles. Zion was our winner. We began our basic planning back in March giving us six months to begin to weigh out our options. 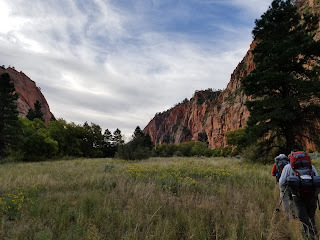 In considering Zion we knew early on that the Zion Traverse hike would be our likely top choice amongst all the other dayhiking options. The Full Traverse takes backpackers from the western end of the park into the canyon bottom and then on out to the eastern end (or vice versa). 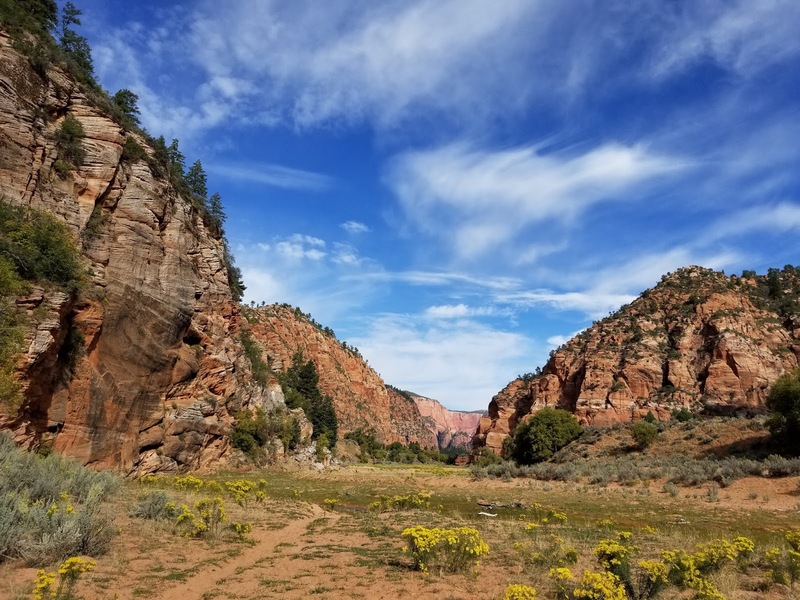 We began to lay out itinerary possibilities and soon fell into the plan of hiking the western half of the traverse back into the canyon. I don't recall exactly why we didn't strongly consider also the eastern half of the traverse other than the wish to have one day for day hiking and other options in the canyon. Our first reservations were to get airfare and a car rental reservation in place. The car reservation we were later able to rebook at lower prices. 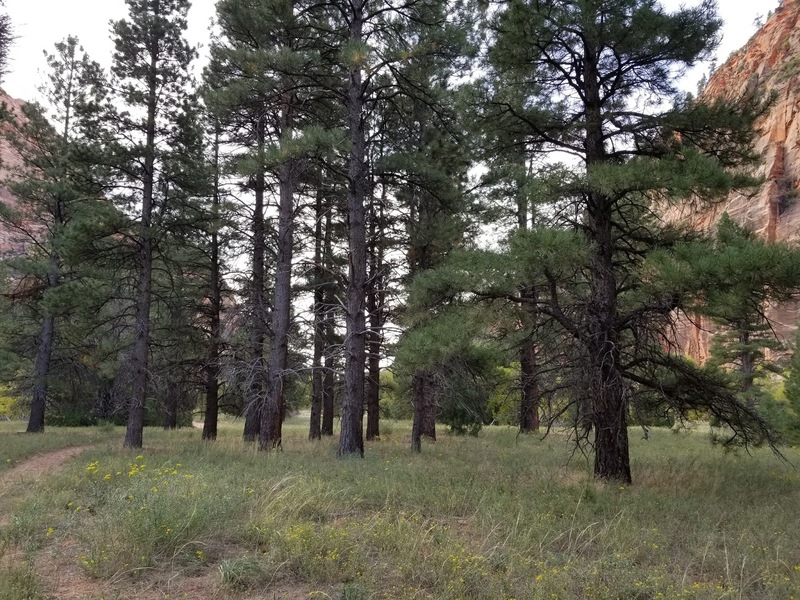 We also booked the week of nights at Watchman campground in the valley to ensure a base camp and a place to stay at both ends of the trip. We did the campground reservation fairly early on to make sure we got it. In our research on Zion we learned the only other reservation to be made was to get backcountry permits when they became available. 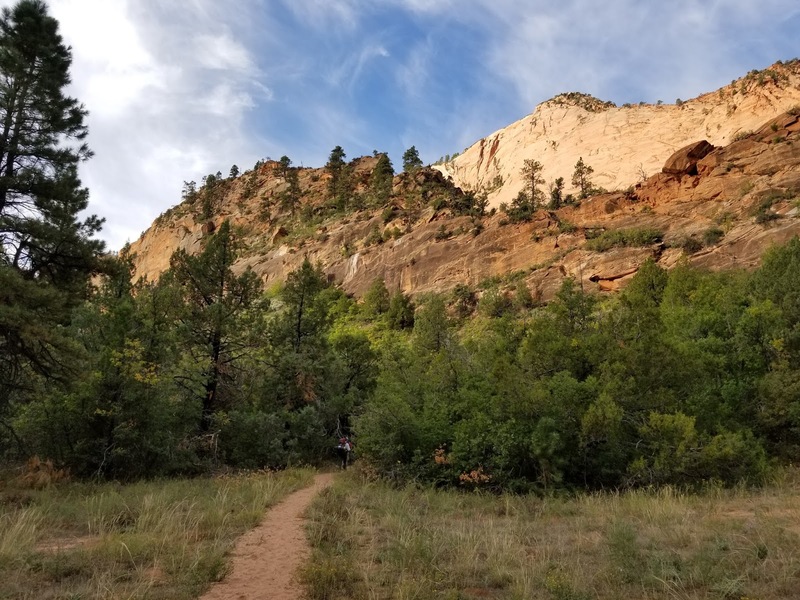 Zion had a chart on their website listing the dates when the permits for our hiking dates became available. For us it was July 5, just under 3 months out. Ken and I were both available at the time that day when things opened up on the website and we got our three backcountry nights reserved on permit. The system worked fairly well with only a slight amount of confusion. We weren't able to book it as a whole trip of 3 nights. They had each night as its own reservation to be booked separately. During our months of prep we had a couple of video conversations and plenty of e-mails to lay out ideas and questions. Honestly though, it wasn't a very complicated trip. 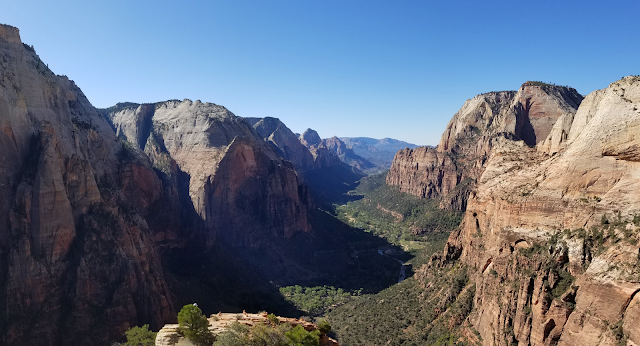 We found planning logistics for Zion much easier than Yosemite. One of the other reservations we had to make was to find a shuttle to get us to the Lee Pass Trailhead. With a point-to-point hike and one (rental) vehicle at our disposal this was a necessity. 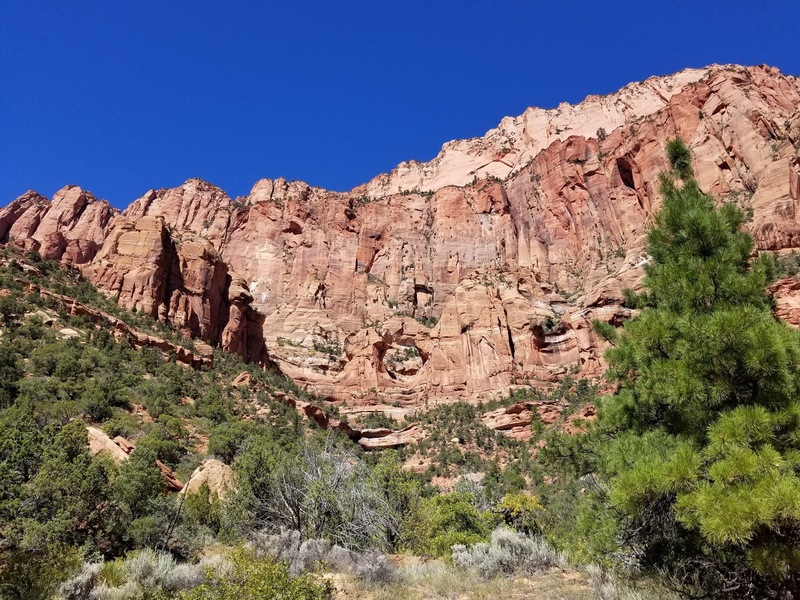 We found that Red Rock Shuttles in Springdale was able to give us the best deal of $40 (cash) per person. We could have a pickup time of 10am with them on Monday morning to drive us out to Lee Pass so that our vehicle could stay in the valley. 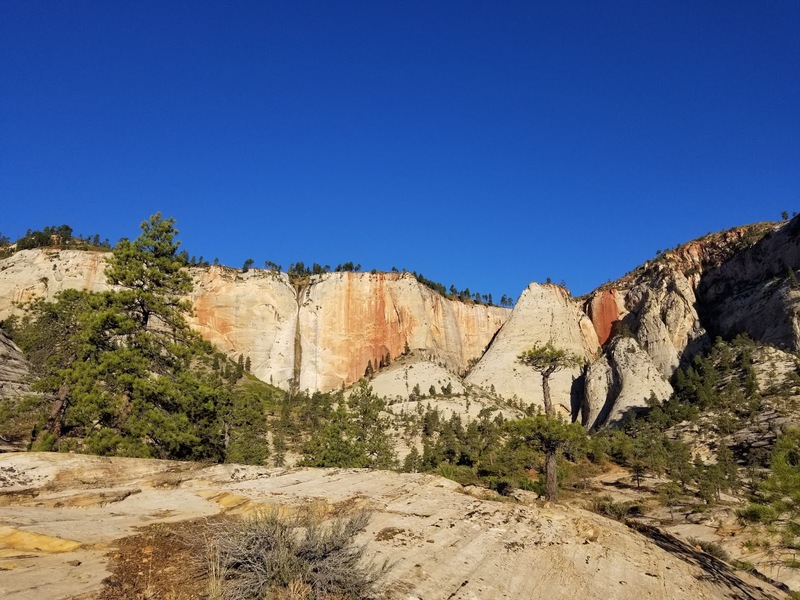 They're also able to facilitate shuttling for those doing the full traverse and to certain other locations around Zion. 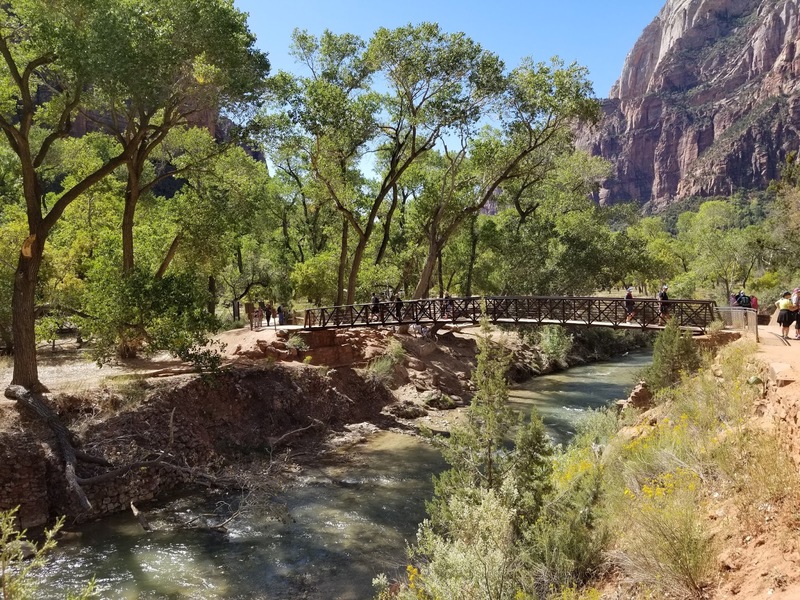 The itinerary for the traverse was also affected by the placement of and availability of the water springs throughout the park. 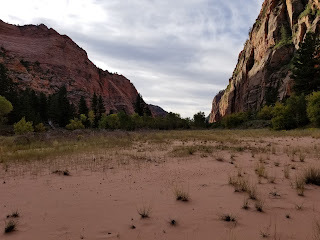 As we would learn first hand, water is one of the key logistical elements of the Zion traverse. There are no lakes and La Verkin Creek is the only usable moving water. The springs are few and far between and not all of them available year-round. Their locations helped force us into the itinerary we would ultimately adopt. In terms of gear, with temps expected to be on the warm side and no technical gear needed, the packing was fairly straightforward. We were able to treat tent, kitchen gear, and a few small essentials as group gear and shared several things. 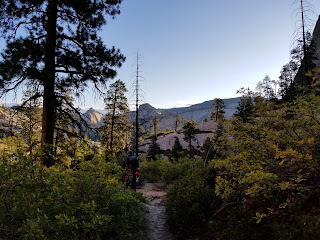 We ended up using my REI Half Dome 4 as the group tent on trail all week while leaving Ken's Half Dome 4 setup at basecamp in the valley as "home". In the two weeks leading up to our trip we began to check the NOAA weather forecasts for the different areas of the park we would be hiking through and we were pleasantly surprised. 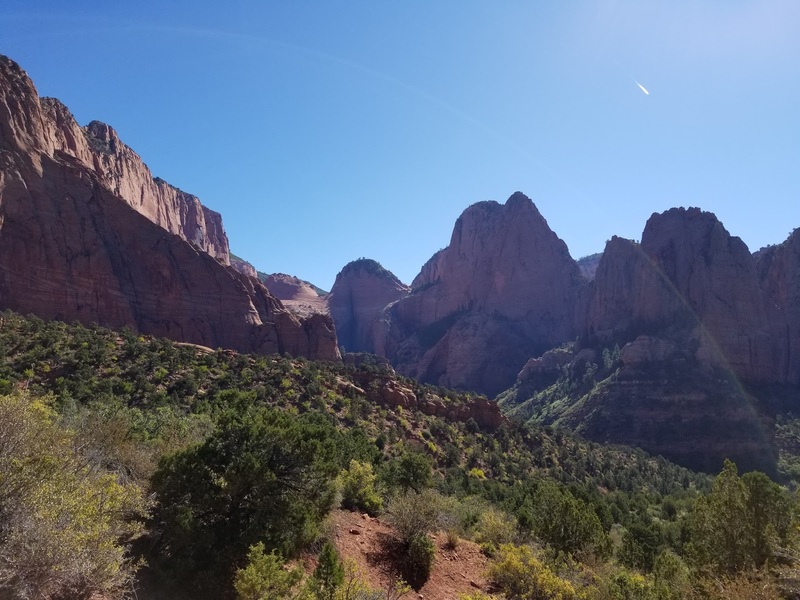 We had been concerned we may be hiking in 80 and 90 degree weather but came to find out Zion was being hit with a cold spell. It was going to be 20 degrees cooler than what we had originally expected. Overnight lows would actually be in the low to mid 30's outside the canyon, so much so we actually began to think about bringing more clothing layers. Our final preparations involved double-checking who was bringing what of our group gear. Matt took charge of buying up enough freeze-dried meals to cover our evening suppers. 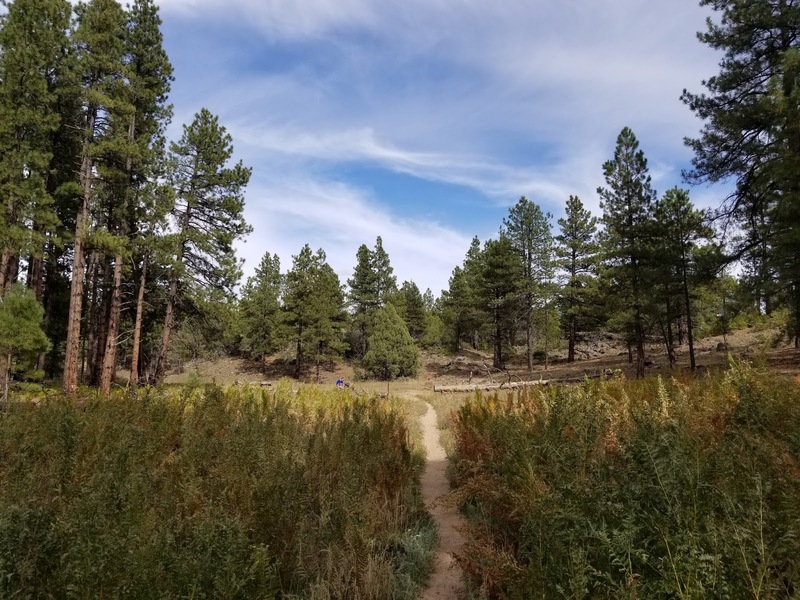 We each packed our own trail and lunch foods to get us the needed calories. I developed a plan of about 2500 calories for each day and listed out what I wanted to be eating for each meal/snack of the day. This was really beneficial in terms of figuring out how much (not too little, not too much) food to pack and carry. It also helped on a daily basis while out on the hike to be able to gauge whether I was eating well. Our travel plans brought us into Las Vegas on Sunday, with Ken arriving early to be able to buy us some stove fuel. 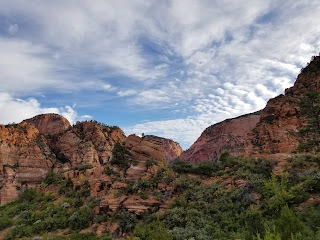 Matt and I arrived in the evening and then together we made the drive out to Zion. It was around midnight local time when we setup camp in Watchman and made preparations for the morning. With a 10:00am shuttle pickup we had time this morning to get our things in order. When the Backcountry office opened we did need to go and pick up our permits. Before 8am we went in there and there wasn't really any line so we only had to wait out one person to talk. The ranger we talked to was fairly new but he was still able to help us. Though we had made reservations by two different people for three total nights he was able to combine them all into one reservation. He gave us a printed page with all that info on it (that would become our permit) and also a blue sticker which we were to put on our car. They asked our car location, likely so that if we come up missing they know where to start. We asked questions about water and the springs and he said the springs were all good but he did warn us about Hop Valley water. This we knew about. 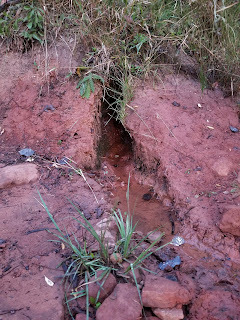 We believe the ranger made a mistake however, when he told us that water drains into La Verkin Creek heading to the northeast, meaning the creek would be contaminated where our camp site was. We would later figure out this was not accurate. When we made phone connections with Red Rock Shuttle this morning we found out we had a misunderstanding. They had told us 10am just yesterday, but their drive was thinking 9am. We learned this right at about 9am, but the driver was willing and gracious to wait til we were ready. Conveniently, we were near ready. We did our last fill of water in our packs, double-checked gear, and were ready to go near 9:30am. We found him waiting for us at the flagpole near the Visitor Center in a 12-passenger van and we were on our way. Our driver was very kind and gave us interesting local information about living in Southwest Utah. We were told ahead of time it would be about an hour drive to Lee Pass and they weren't kidding. When we made it to the NPS Visitor Center for the Kolob Canyons area he told us to go inside and get checked in with the rangers there. We did so and they checked our permit. We also used this as a last opportunity for modern bathrooms. 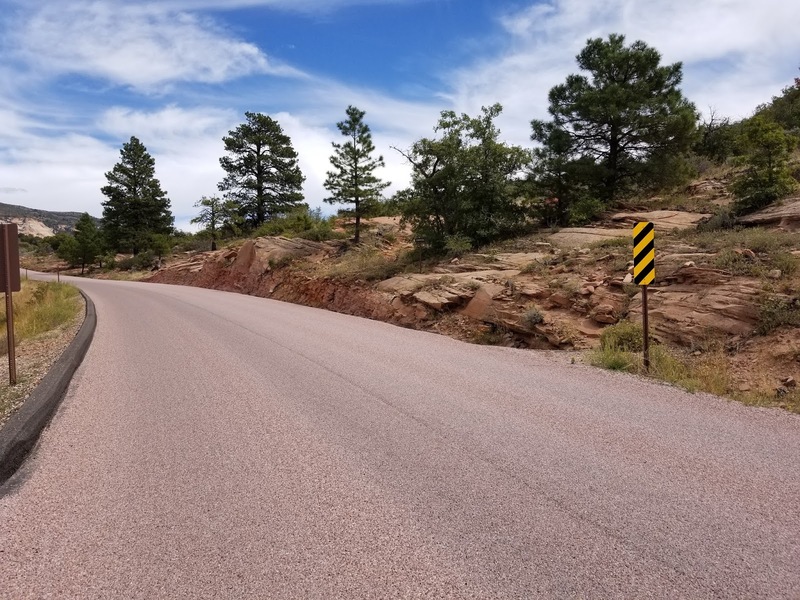 The road up to Lee Pass from the visitor center is short and sweet. The drive let us out at the trailhead and we paid him each $40 in cash for the shuttle, plus a tip. It was about 10:50am when we finally got started on the trail. The actual trail starts just a short walk downhill from the parking area for the trailhead. The first 3 1/2 miles of the trail are almost entirely downhill, sometimes at a good clip, sometimes gradually. The vegetation was mixed, never with tall trees, rarely with thick brush, just that kind of semi-desert vegetation of things taller than you are but still thin enough to offer views. 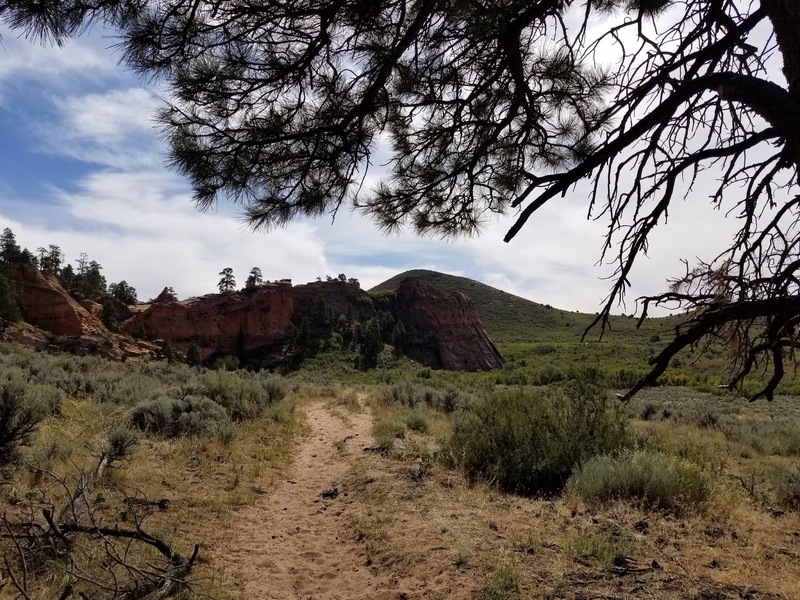 From the beginning we had wondered if the views on all of these western trails would be anywhere close to as good as those in the valley, and we were instantly reassured with a resounding yes. 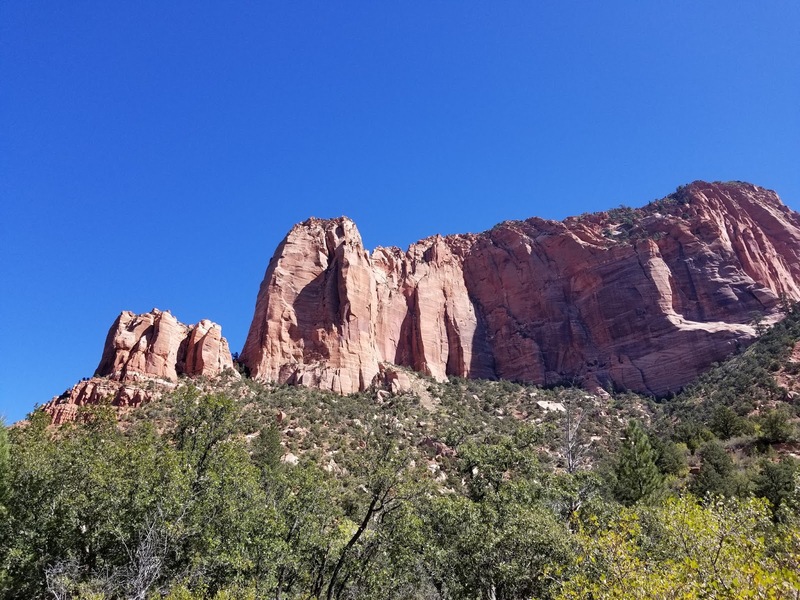 I can see now the reason why the Kolob Canyons section of Zion National Park is absolutely well worth the visit. Since we had a very late morning start we were quickly thinking about food. I had proportioned my food each day to have a set of morning trail snacks and afternoon trail snacks, as well as then a lunch menu. 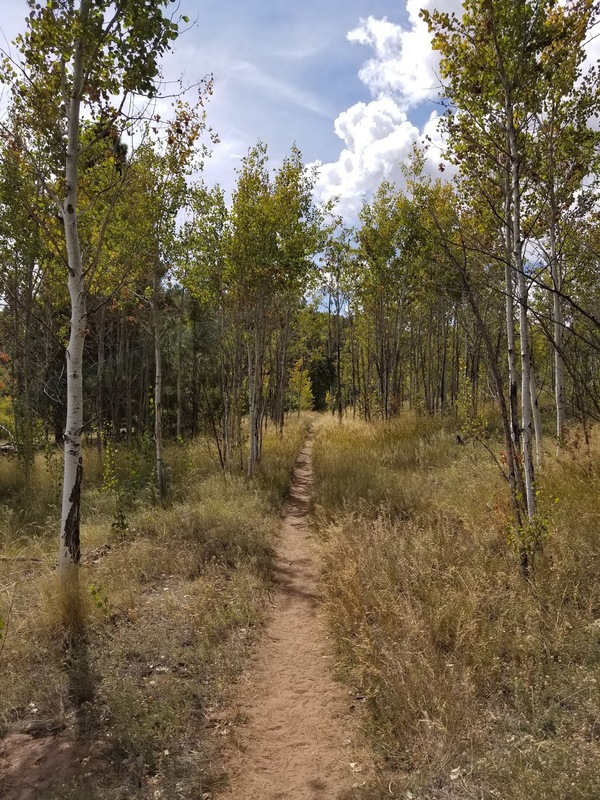 This made for great efficiency while on the trail as I could put the morning snacks in my pants pocket when we set out so that I had it all quickly accessible and I knew how much I had and could eat before lunch. Same in the afternoon. Again, this was helpful in making sure I was getting a good calorie load while also not worrying about eating all of my food in the first two days. I also had a good rhythm of eating dry, salty snacks like crackers and cheese (good for salt-replacing sodium!) but then following them up with fruit snacks to vary the texture and sweetness. As we neared the 3 1/2 mile mark the trail climbed just a bit before then turning east into the La Verkin Creek valley. Near this turn we stopped for our lunch. It wasn't much, mind you, I had just some beef jerky and 2 pieces of string cheese. This meat and cheese style of lunch at least fixed the appetite for getting food other than in bar-form and wrappers. After our brief lunch we set out again heading east toward the Creek. Up to this point we hadn't seen the river or any fresh water for that matter. 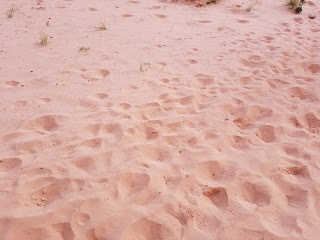 We had had our curiosities of what the "desert" would look like and were pleasantly surprised most of the way. We descended quickly until we finally got our first views of La Verkin Creek. It was nicely flowing and pleasant sight to see fresh water. 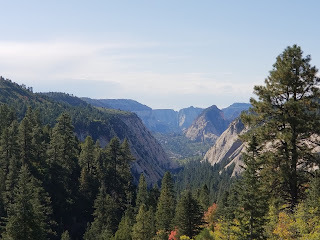 The views in the creek canyon were great as we could see well ahead into this beautiful canyon area. The temps were reasonable for our first day of hiking. It actually felt quite cool and breezy up at Lee Pass, probably in the 50s though we almost felt chilled. Things warmed quickly into the 60s and down by the creek we were in the low 70's. The breezes had left us down there and so it actually felt plenty warm. We made a stop at an opening we found near the creek to get some water to splash on hats and arms. A recurring theme we started today was giving thanks that it wasn't in the 80s or 90s as it often can be even at this time of year in Zion. 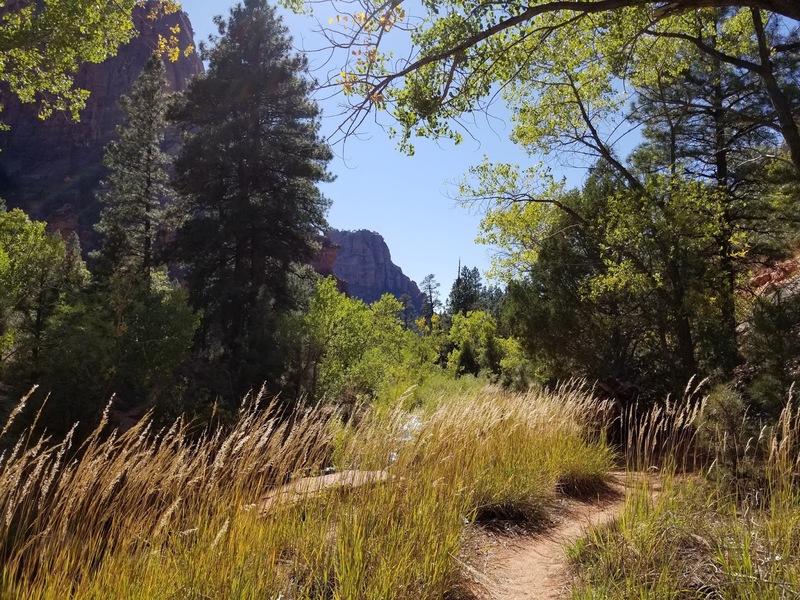 The trail takes on a gradual ascent once it meets the creek. 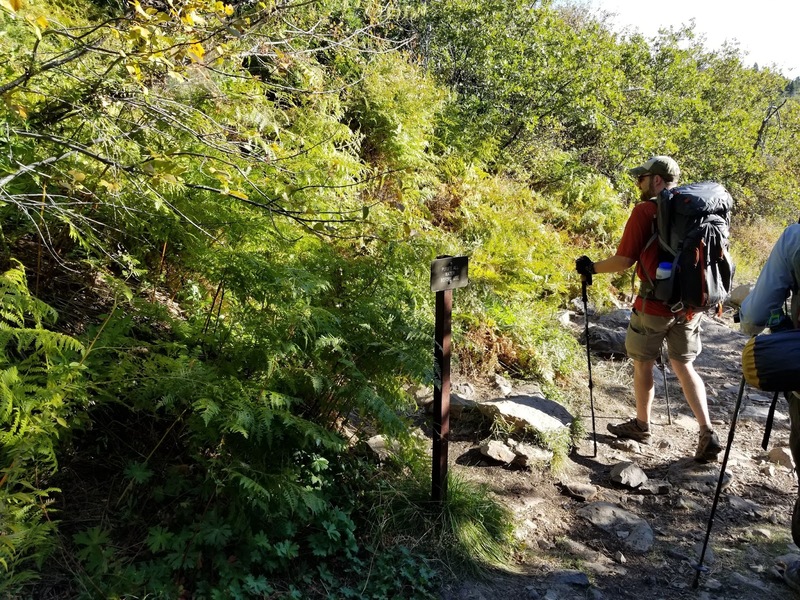 We did note with every slight uphill that when carrying a heavy pack that is very noticeable on your back, your hips, and your overall cardio. We began to pass more of the reservable La Verkin creek campsites. We were surprised how early on the trail some of them were. Others were very nicely situated by the creek and with beautiful views. We found that sites 9 and 10 may well be the most desirable. In fact, as much as we would end up enjoying site 11 we would recommend #10 as best for location and convenience should there be a next time. After passing site 10 it wasn't long and we hit the well enough signed intersection with the Kolob Arch trail. We noted it and moved onward. The trail meanders onward by the creek a bit after that junction til it ascends a fairly steep section of hill which we really felt nearing the end of our day and still bearing heavy packs. This is basically the beginning of the ascent out of the canyon, except we weren't leaving it today. This gained us the junction with the Hop Valley trail which was again well signed. 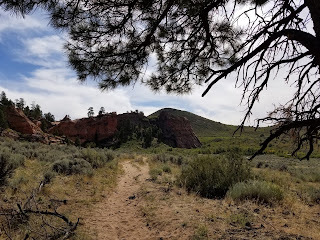 We continued eastward on the La Verkin Creek trail which then began downhill once more to return to the creek. This part of the trail was noticeably more unkempt and less traveled. When it passed by the drainage creek (barely existent) from Hop Valley there were a few small rock steps to negotiate. After the trail regained the creek it wasn't long til we found the sign for site 11. 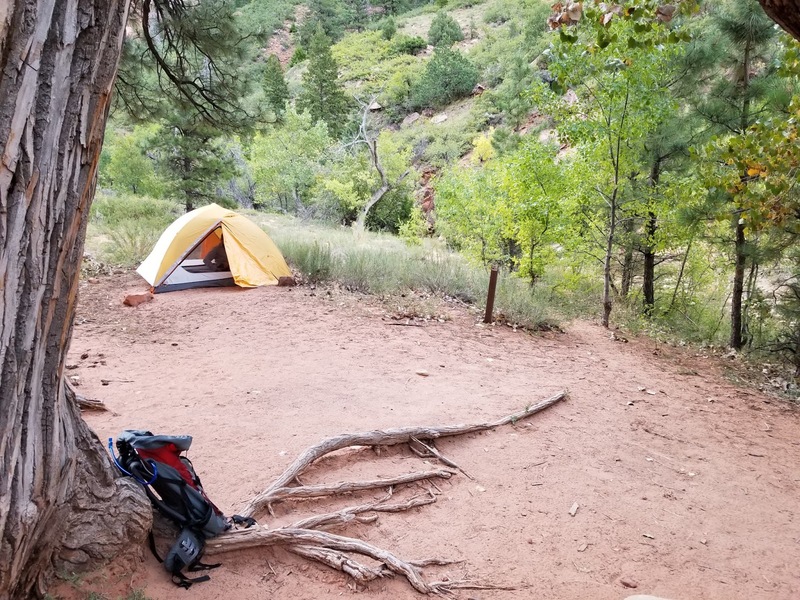 We had to cross the creek with a few careful rock steps and were pleasantly surprised to find a wonderful camp site with pretty decent views. It was just before 3pm when we made it making for a first day's hike of just under 4 hours. We got camp setup finding a nice sandy-bottomed tent pad which would make for much better sleeping than the rocky pads in Watchman campground. My watch was showing we had gone 7.39 miles with 411 of ascent and 1193ft of descent. The mileage may had been just a slight bit high. We were at camp only about 40 minutes when we decided to head out for Kolob Arch. We wanted time enough to go to the arch and back, yet also be able to cook and enjoy camp before things got dark. We retraced our steps back to the junction which was just under a mile away from camp. We were each only carrying a nalgene for water. 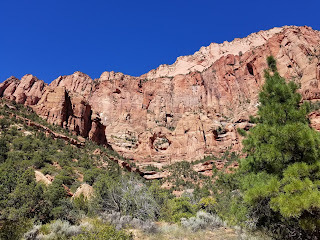 Once on the Kolob Arch trail we found ourselves heading into a narrow slot canyon. 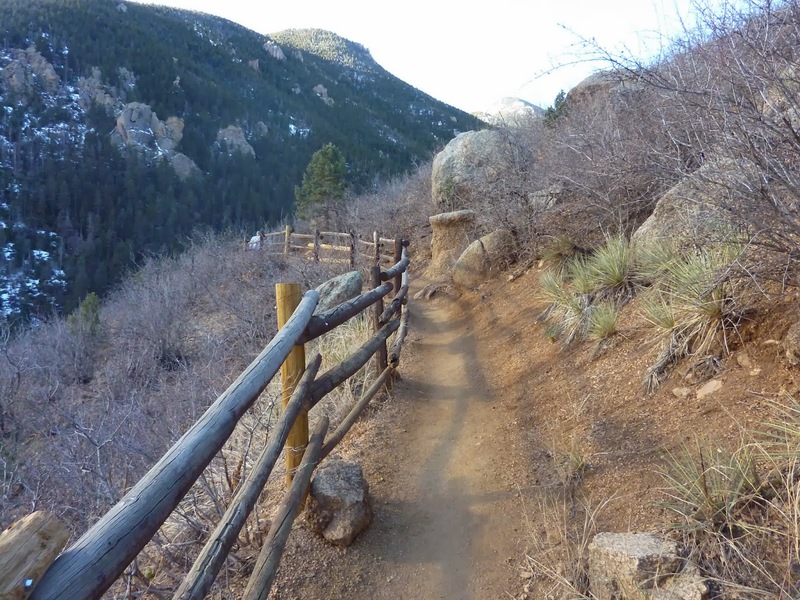 The trail was thusly crunched for space at times having to work through steep terrain onto the sloping sides. 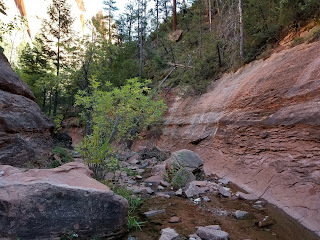 There were a number of places we could see evidence of previous flash flooding in this canyon. When we finally made it back to the viewing area for the arch, I could honestly say we were a bit underwhelmed. 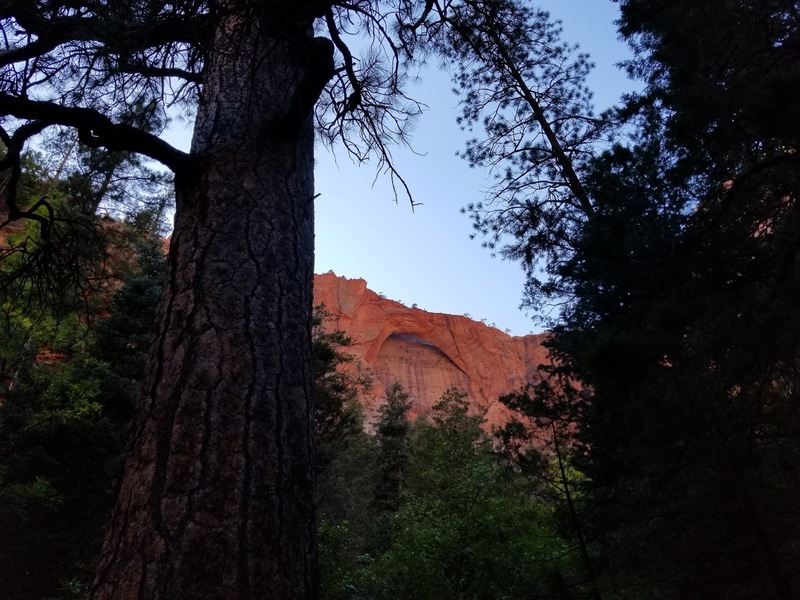 The trail makes an obvious stop and you look up to your left and see the arch through the trees. The arch itself is not very prominent from the rock behind it. 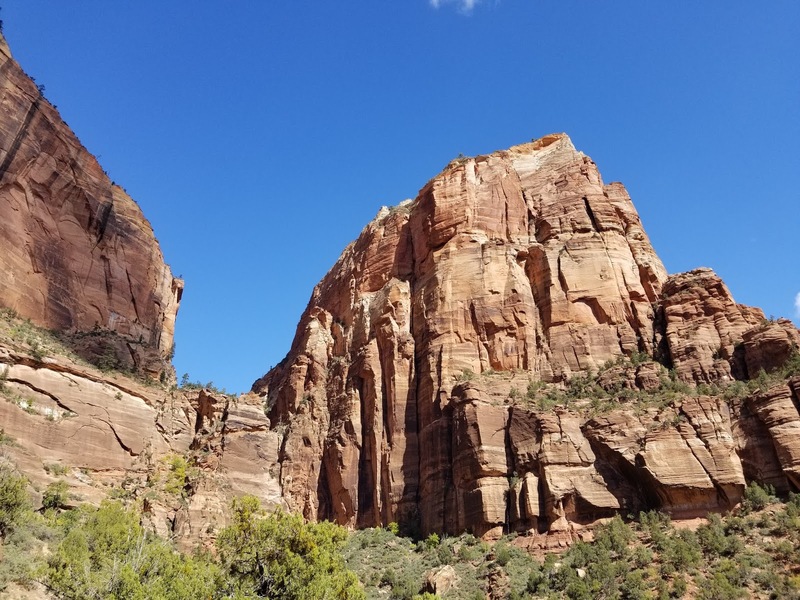 Perhaps one has been spoiled when they've seen arches and other rock formations in other parks. 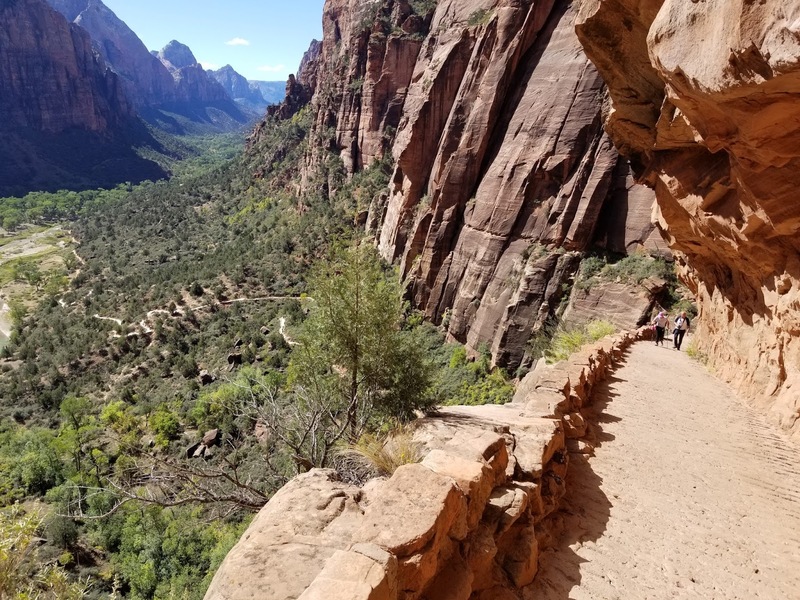 But I can honestly say I was more impressed an in awe at most every other view we had of the canyons on our hike in than of the arch itself. We spent a few minutes grabbing photos and then made the hike out. When we made it back to camp I was intrigued to see my watch said 2.73 miles expecting this to really only be a 2-mile hike. Its quite likely the narrow canyon walls played with the GPS signal a bit and added a little something extra. At camp we set about cooking up our first night's meal on the stove. We had pairs of freeze-dried meals for all our suppers this week. Tonight's menu included Chicken + Rice and a Chili Beef Mac. Both were great meals as most things are when you're in the backcountry. We found the outdoor temps cooling quickly as the sun set. We had been prepare for temps to get down to the low 30's during our nights this week. This particular evening, while it did cool, we're pretty sure down in the canyon it was more like mid 40's which actually made for a nice night. The cool temps did ultimately drive us into the tent and the sleeping bags not long after sunset which made for unfortunately short evenings. The no campfire rules in the park of course didn't help, though they are very understandable. We were up at 6:45am today hoping to get a nice and early start. If we got up any earlier we'd be spending too much time in the dark. Yet we also didn't want to sleep in as we knew we had a full day ahead. 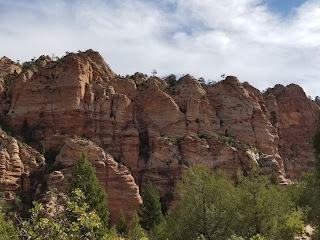 Today was the big day for us on our Traverse itinerary as we needed to make it all the way to Wildcat Canyon which would be around 14 miles. To further complicate today, there were really no water stops along the way which meant we'd have to carry all the water needed for the day. 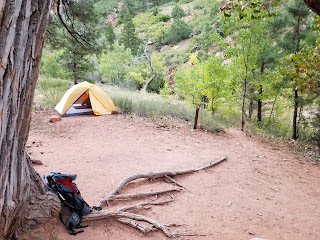 We also didn't know if we'd camp close to the Wildcat spring which meant we really wanted to carry our water for the night's meal, and possibly the morning as well. This meant, for me, maxing out my water capacity. I had a 2.5 L Osprey water bladder, a Nalgene, and also two 32oz. Sawyer water pouches. In all I had almost 5 Liters of water and all of their weight. For water filtration we were using Matt's Steripen and my Sawyer mini filter. 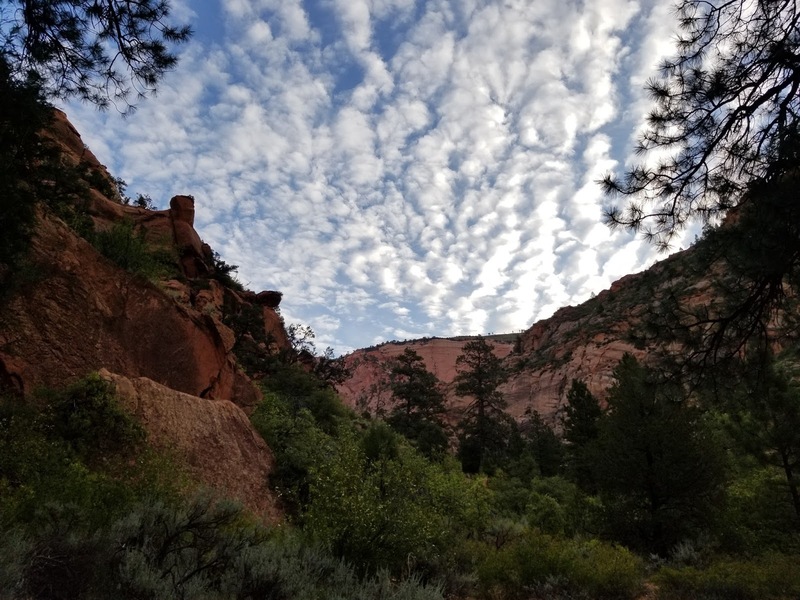 We had decided ahead of time that with three of us over 4 days and in country with very little water it was prudent to double up on our filtration methods. It also made for an interesting comparison between the UV method and the mini filter method. The Steripen proved to be slightly quicker as one only needed to fill a Nalgene and then run through the 90 second sterilization procedure. The Sawyer was nice in that I could fill up my 32oz. bags from the water sources and then filter them at my leisure. This proved helpful at times as I could fill the bags and then take them back to camp and filter them at my chair or even carry them and filter them later. After getting out of the tent into the chilly air we got the stove going right away. We heated water so that oatmeal and morning drinks like coffee and hot cocoa could be had. This was a nice thing to have that warm morning drink given that the temps were probably around only 40 degrees. For food I was eating Nature Valley oatmeal squares every morning. 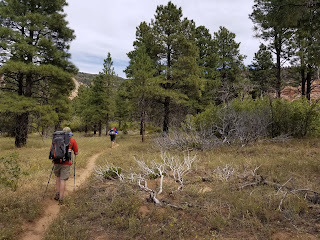 We were out of camp at 8:11am today and back on the trail back to the junction with the Hop Valley trailhead. We were a bit chilled to start but knew we had a big climb ahead of us and would surely warm quickly. And so we did. Its nearly 500 feet of gain as the trail works several switchbacks to gain Hop Valley. 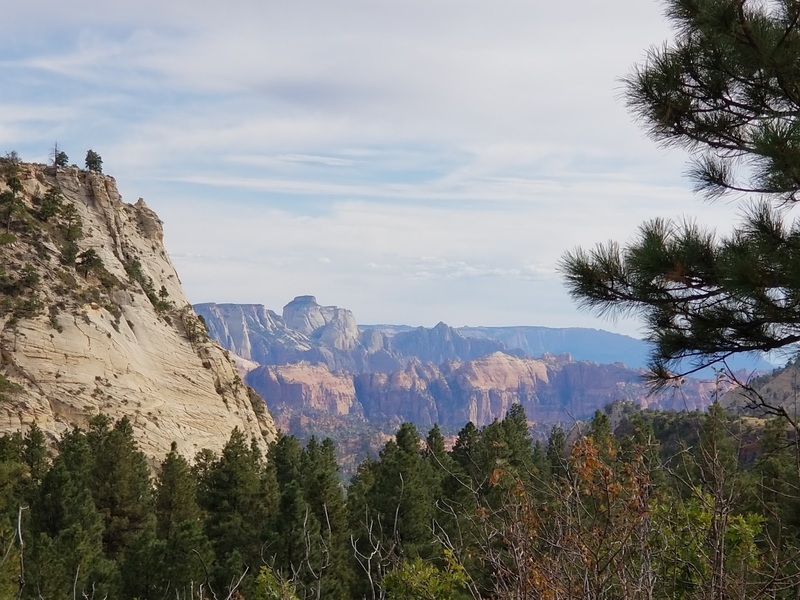 We stopped in a handful of places to take in the amazing views of the canyon walls. One really appreciates the value of every ounce in their pack when hiking uphill as we were. I hadn't packed overly conservative for this trip taking along a handful of luxury items. 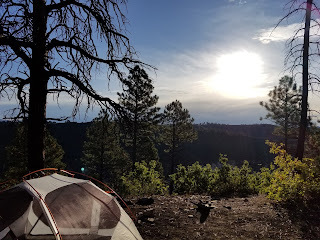 I tried to keep food and clothing at their bare minimums but in return I carried along my REI Flex-Lite camp chair which was a real hit. Not only was it nice to sit in at camp but found it useful for setting gear on as well as putting my pack on it overnight. Well worth the weight on a trip like this. I was also carrying to Anker battery packs to charge phone and Garmin watch as well as my GoPro camera. After about a mile and a half we finally stopped gaining and felt like we were in Hop Valley. We were impressed with the beauty of the forest terrain at first. This would be another recurrent theme throughout the trip. 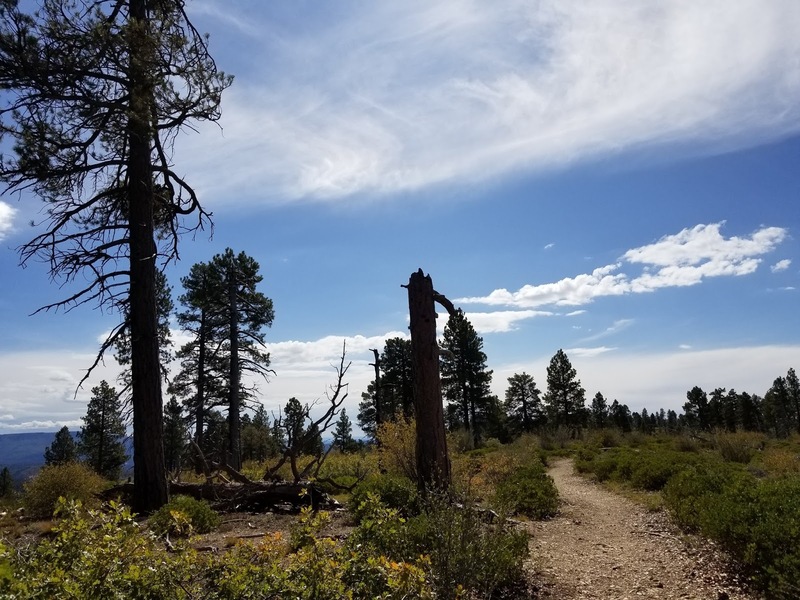 While we had expected desert terrain in many places we found ourselves in the midst of beautiful forests, and not always coniferous as is often the case out west. In fact, at 2 or 3 points I remarked I felt like I was back home in the Midwest with fall colors and thick foliage at our sides. The trail leveled out as we walked through a beachy area of sand where the trail meandered over to the east side of the valley and on the east side of the growing creek. From here the terrain became a pretty consistently flat valley with mixed grass and sand sections of trail. 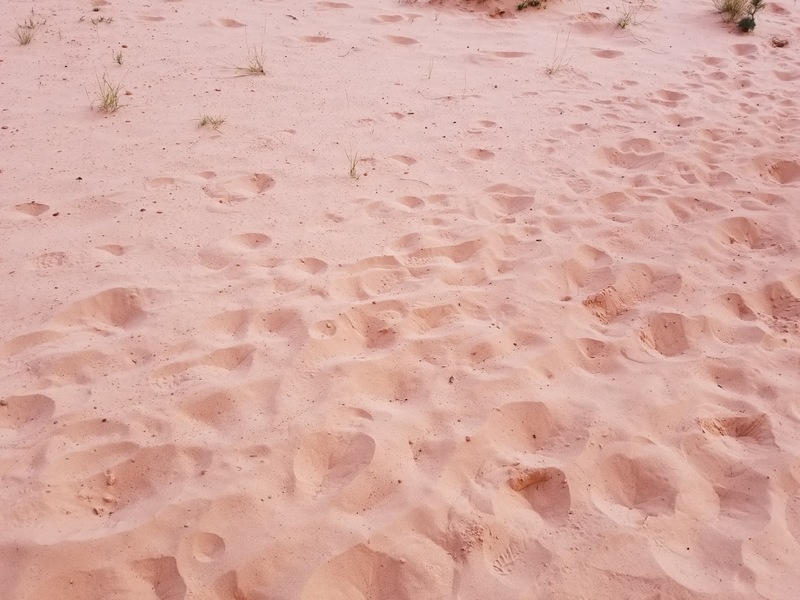 We had heard the sand can be a real hassle for hiking in here but we didn't find it overly burdensome. At times it was really like walking on a beach, at others it would firm up. The more challenging hassle in Hop Valley was the constant stream crossings. Some had obvious rocks or logs which we could cross carefully. Others we had to get a little more creative in moving a fallen log to make the crossing possible without getting the shoes drenched. There may have been 10 crossings though I really lost count. We never once had to get the shoes underwater, though we had a fair amount of close calls. After almost 2 hours and 3 miles of hiking we made a morning snack stop at some fallen logs. I ate up a number of my morning snacks and we took about 20 minutes to take a good break. We felt like we were making pretty good progress. Yesterday we were averaging almost 2 miles an hour, today was more like 1.5 but with the stream crossings and uphill we figured that sounded about right. We had our first cow encounters after our snack break. We probably saw half a dozen cows just munching away on the grasses. 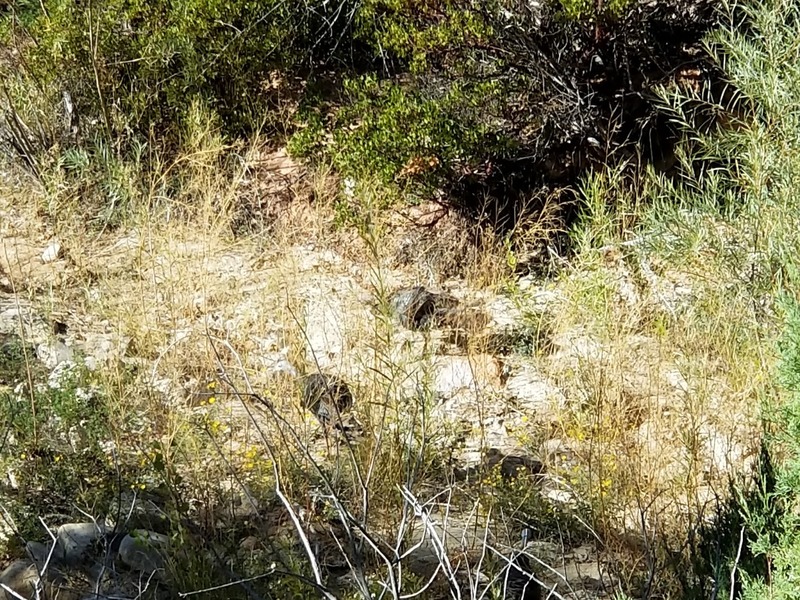 We also encountered a pair of backpackers who say they had come from Wildcat Canyon, possibly, by their description, the very same area we hoped to camp tonight. We were amazed to encounter them here so early in the day already, speculating they must have had a really early start. Just after those two hikers we also bumped into two rangers. They had daypacks on and were moving along, we were surprised they didn't stop us to check permits. At about 4.5 miles in the lower part of Hop Valley narrowed up a bit. At one point it narrowed so much, and coupled with a pair of cows blocking the only passage, that we were forced to hike up onto a looser dirt slope to bypass it all. It was after this that we began another fairly steep and almost grueling ascent (with heavy packs) to begin the climb out of Hop Valley. 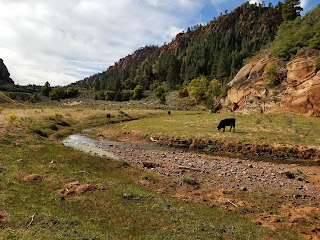 It felt like we were hiking on a dirt 4WD road, and given the cattle presence in the valley its possible that's what it was. The steepness leveled out after a half mile but the ascending continued at a gradual tilt. The vegetation here also began to close in more on us as we left the valley. 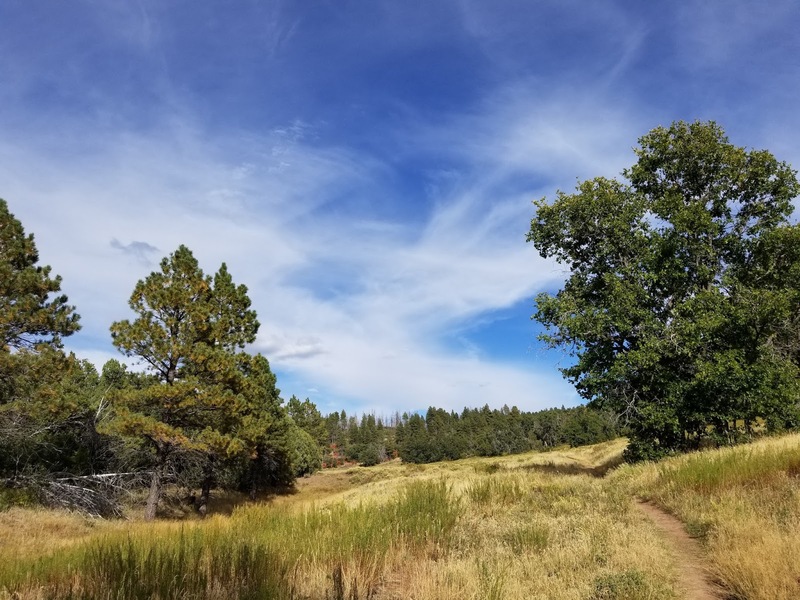 Around 5.75 miles for the day we passed through a beautiful meadow. We encountered a few more cows here. 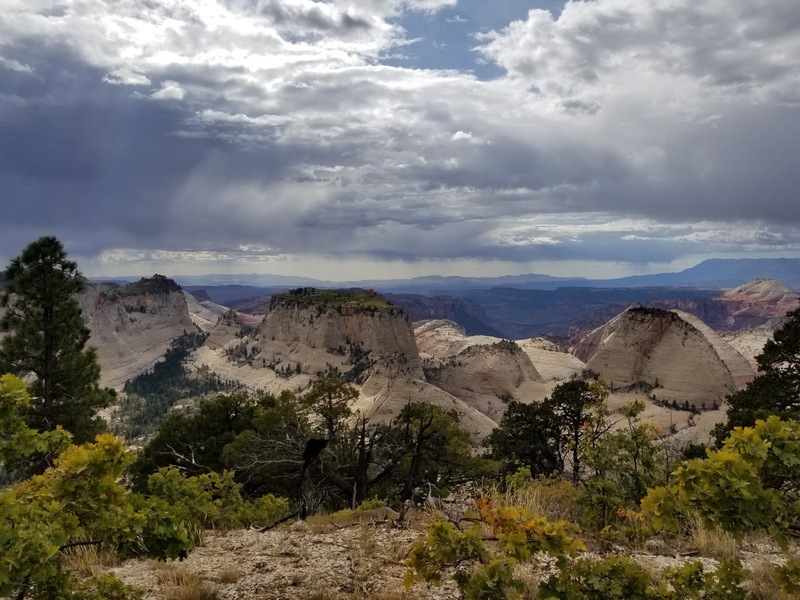 The views opened up for us to see Firepit Knoll to the west, the trailhead and road out ahead of us, and expansive views to the southwest. The trail continued onward, bypassing some rock cliffs on the west side and finally wound its way up to the trailhead. The junction for the Connector Trail was just before the actual trailhead, but we moved past it. We were pleased to find pit toilets there at the trailhead so that we could take care of a few things here rather than in the wilderness. It was also nice to find some shade as the temps were easily in the mid 70's and things very sunny. It was 12:47p when we made it, having been on trail for about 4 1/2 hours. My watch said we were 7.4 miles in already which was a bit more than what we had read for the Hop Valley trail. We did our day's lunch while at the trailhead. 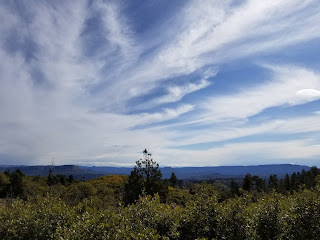 I also took my first opportunity to check cell signal and sure enough my Verizon phone had a bar or two so I made a call out to my wife to check in and let her know we were doing well. We were also intrigued to find some folks had stashed water there by the bathrooms. They were smart and helpful in putting their last name and dates expected. I'd be curious their itinerary for using this as a water stash. It was 1:22p when we set out again, having taken about a 35 minute lunch break. We made our way back to the junction with the Connector Trail. 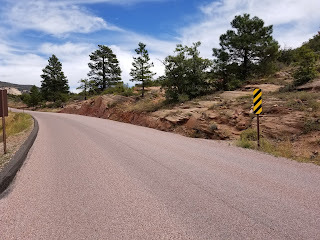 We then followed it perhaps half a mile til it met up with the Kolob Terrace Rd. There was a sign at the road with an arrow pointing forward with the trail. We took a long look at things to see if this meant the trail went up the road a bit or if the trail continued immediately across the road. It appeared there was some semblance of trail across the road so we hopped on that and it took us to a large slabby area where we thought we could see more trail on the other side and sure enough this was it. As usual, I checked this against the maps on my GPS and we were looking good. We soon found ourselves in a beautiful meadowy area with short desert brush and plentiful views. We could even see someone's large house sitting on a hillside on the north side of the road. 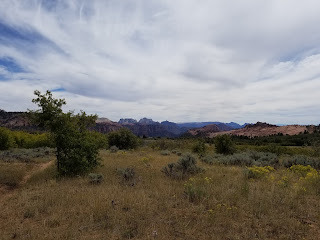 The largest peaks we saw in the distance were liking some of the ones lining the southwest end of Zion Canyon. I was doing my best to grab pictures everywhere I could along our hike. I was also making efforts to grab 360 Photos using the Google Street View app on my phone. Before this trip I had gotten my hands on a new Samsung Gear 360 camera, but it arrived dead on arrival much to my dismay. I had to send it back to Samsung for either repair or replace and unfortunately they did neither before I had to leave for this trip. Samsung terribly slow and unhelpful in this regard. 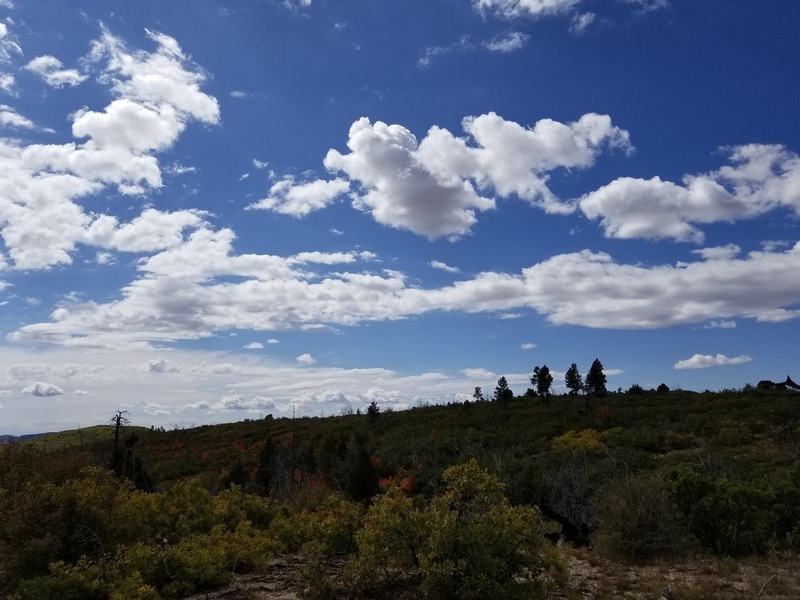 Today was our first day getting any amount of clouds which added nicely to our photos. They didn't amount or threaten for rain today but they made for the occasional shade from the sun which was helpful. As we worked through the meadows on the Connector this led to a short descent into a small valley. We could see ahead of us a ridge to the east which would be gained to take us by Pine Valley Peak. We wondered where it was the trail would take us up to that prominent ridge. As we neared we realized it would be through a large area of slabby rocks. 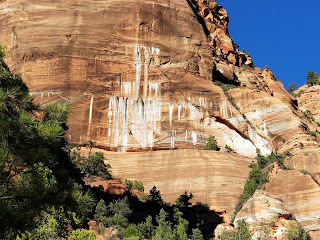 We were intrigued at the striping, often with curves that we saw on the rock in this area. We also had to pay very attention for trail here as the slabs themselves showed nothing. 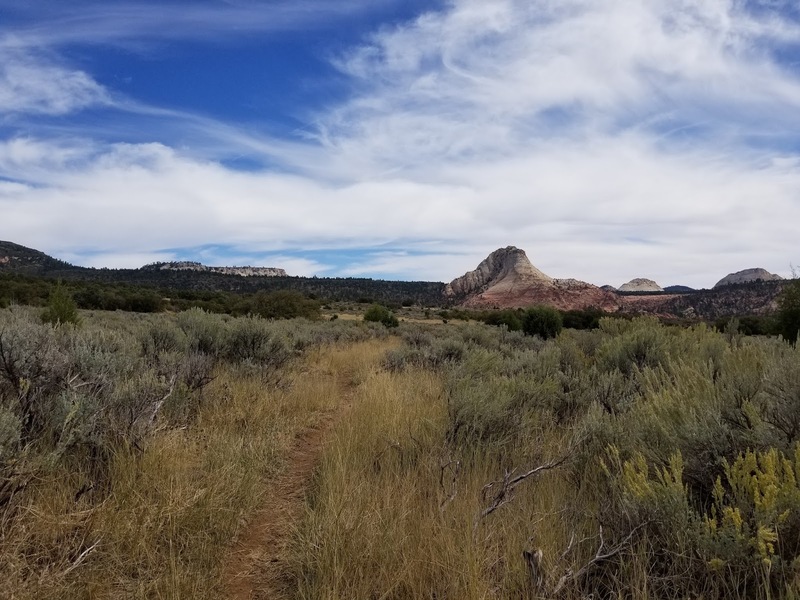 We had to be very attentive in looking for signs of human travel and using better judgment in figuring out where the trail would likely be leading. We were successful in our route-finding. I was intrigued looking at the rock sides of Pine Valley Peak wondering if there was a non-technical route to its summit. The rock looked very steep and smooth enough to make an easy ascent nearly impossible. 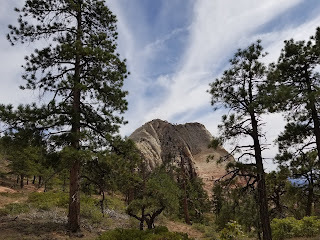 As we moved past this interesting peak we dropped into a beautiful pine forest. The views weren't expansive but the trees and the forest itself was gorgeous. There was enough of a slope to our north that we couldn't see the Wildcat Canyon trailhead and we rolled on by it. We gained the junction with the Wildcat Canyon trail at 3:45pm. We were still feeling good overall, though there were a few foot blisters going on. We spent a few minutes time at the junction doing some foot work. It wasn't long after we set out from that junction that we passed the junction for the Northgate Peaks. Another day, another time it may have been interesting to go and check out those peaks. The terrain became increasing thick forest with many fall colors also coming in. The trail here increasingly gained terrain with us picking up almost 500 feet after the junction. To our east we were occasionally catching glances of Russell Gulch. We knew that backpacking options picked up after we passed by the gulch. This became evident when we reached some grassy meadows. This area was again, beautiful. I had done work on Google Earth before our trip trying to look at this area and figure out likely dispersed camping areas. I had looked at spots immediately on the west end of the meadows but had ruled those out because of their distance from Wildcat spring. I had then deduced there must be a good spot on the far east end of the meadows, in the trees overlooking Wildcat Canyon. Such a spot might have views and the best possible proximity to the spring. As we passed by the meadows we pulled off the trail just before its left turn to the north to head to the spring. 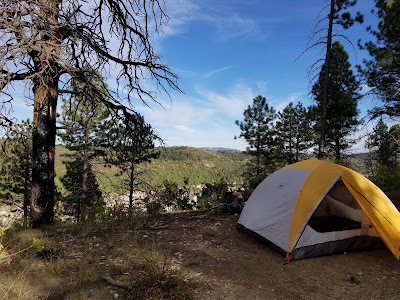 We dropped packs and meandered out to the rim of Wildcat Canyon and sure enough there was a wonderful dispersed camping spot that had been used before. We got camp setup and designated a nice area for cooking as well. Everything about this spot seemed to be just what we could want. Matt took it upon himself to walk up trail to scout out the Wildcat Spring and much to our delight it was easily discoverable, the water was flowing, and it was perhaps only 3/4 of a mile up trail. For supper tonight we cooked up spaghetti and chicken-n-rice, all of which was wonderful. We were also fortunate that we didn't really need to make a major water run and that which we had carried would work out well. We were in the tent tonight just after 8p as the dark and our own tiredness helped us call for an early night. I stayed up awhile reading but was probably out by 9:30pm. One of today's highlights came first thing. We knew the morning views out the tent would be gorgeous, and we even setup the tent to try and take advantage of this. We opened up the east side of the tent and just soaked in the rising sun and the beautiful canyon views. Combining the views with the cool air it hardly made us want to get out of the sleeping bags. We probably could have sat there all morning. As it happened, we did decide we could afford to take it a little easier today and not think we had to be in a rush. Yesterday was the longer day with more uphill and more carry, today was marginally easier. We did heat water for breakfast with what we had leftover from yesterday and took in hot oatmeal, hot cocoa, and coffee. I ate my usual oatmeal squares. We took our time getting camp packed up and were on the trail by 9:13am. It didn't feel like very long on trail that we made it to Wildcat spring. It helped that Matt had already scouted it out the night before, but we were also pleased to see it was well marked with a sign. It would have otherwise been fairly easy to walk right by it if you didn't know where it was. The spring was a trickle about 10 feet off trail amongst some rocks. You had to reach your arm into this darker spot where the water was dripping down. To add to the fun there were about 2-3 bees hovering and flying around in the area so we proceeded carefully. The flow of the water was enough to fill a nalgene in perhaps a minute's time, so it wasn't unreasonable. We each filled to about 2-3 Liters capacity per person which we deemed enough for today. We knew (were hoping) we would also have a chance at Potato Hollow to hit another spring. After about 20 minutes of water work we hit the trail again. We followed its descent to an old creek bed and then began the ascent to the next trailhead. This trail had a consistent, almost double-track width with a fairly consistent grade of gaining elevation. 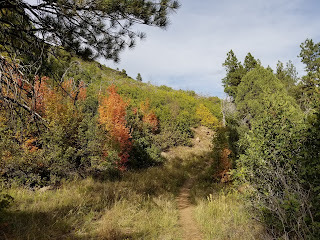 We got sporadic views of wildcat canyon as well as varying colors of tree leaves. We took our time working upwards through this morning's ascent believing it to be our biggest climb of the day. Things finally leveled out in the last 2/10 of a mile to the trailhead. 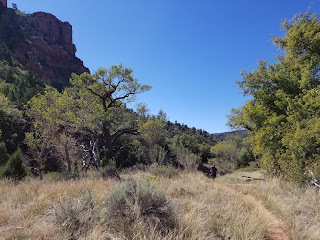 We found that the junction with the West Rim Trail (which was marked) was actually about a 1/10 of a mile from the trailhead. 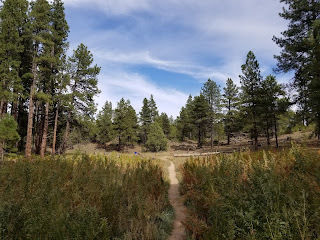 We decided to make the walk up to the trailhead to check it out and hope for a bathroom as we had found at Hop Valley. We weren't so lucky this time. We had even looked at the satellite maps and it appeared there was something shiny, possibly like a structure on the images, but that turned out to have likely been a parked car. We ran through a short debate on whether to make the hike up to Lava Point. We knew it would be a solid mile and 500 feet of climb each way, plus the views, while certainly of some beauty, weren't any more impressive than much of what we had seen. So we opted not to take the time or effort for Lava Point. 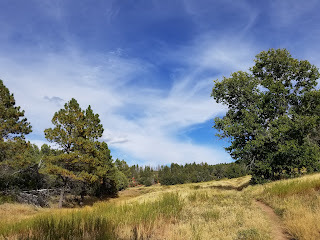 Instead, we began to make our way on the long trek southward on the West Rim Trail. It was just before 11am when we had hit the junction and moved onward. The initial portion was slightly downhill and then began to level out. We found ourselves basically on the crest of a ridge with some views to both east and west which was nice. The ground vegetation was short and in many places non-existent. The trees were tall and thin in their cover which helped the views. 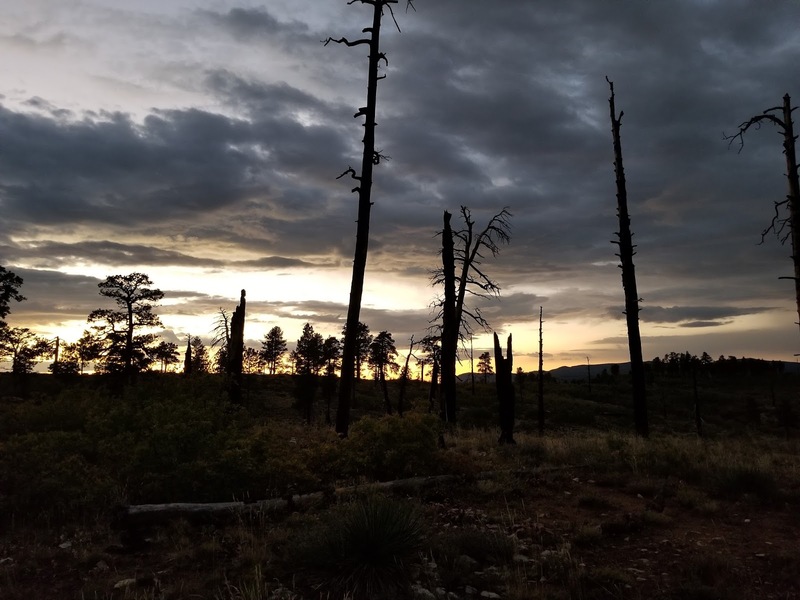 In many places it seemed there was strong evidence of forest fire in the last decade or two. The turn-off to the first campsite and Sawmill spring was marked. We didn't actually head down that way to check out the spring though. The first 3 miles went pretty smoothly and after the initial descent things were mostly flat with just small ups and downs. I had harbored some aspirations of making it to Potato Hollow for lunch so that we could combine a bigger water stop with lunch but it quickly became evident it would be nearing 1:30 or 2p when we made it there. 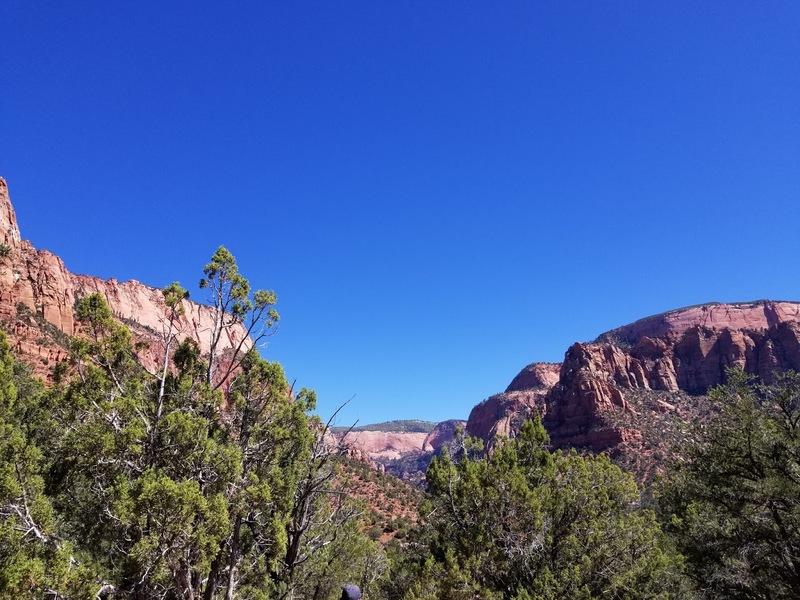 Instead, we came across a nice couple who had stopped at an overlook on the west side of the trail and it had amazing views, some of the best of the whole trip. It was 12:20p and it didn't take another moment's thought for us to decide, this was our lunch stop. It was fantastic. I have this stop marked on my KML map below. It especially featured a prominent view of the South Guardian Angel to the west. We struggled at times to describe how we felt about the West Rim Trail. While at moments it provided views that were nearly on par with the previous trails we had been on, at other moments we had to confess it was borderline monotonous. 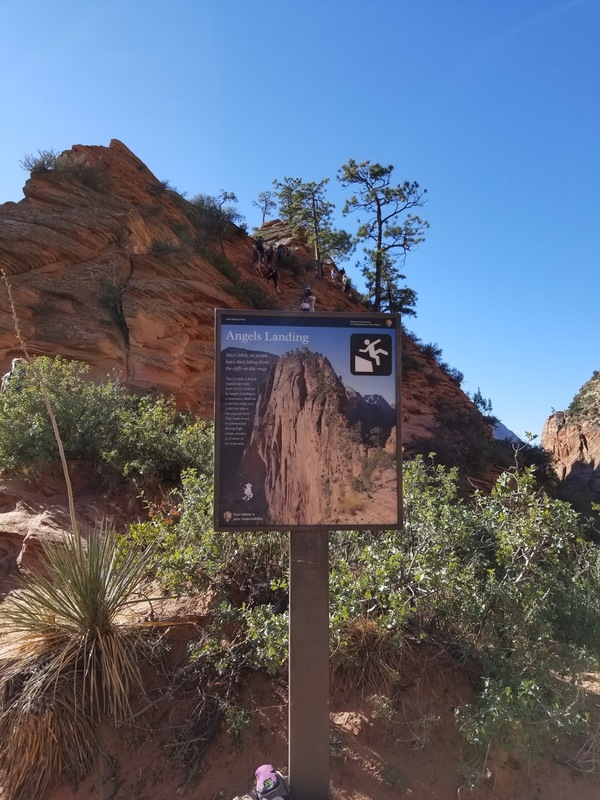 Now that is a very relative statement, because compare the West Rim Trail to some flatland trails in the Midwest and this will still take the cake. 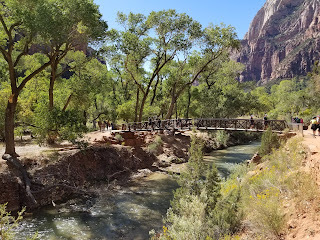 But compare it to the variety and splendor of our previous' days trails like La Verkin Creek or Hop Valley, or even the Connector, the West Rim Trail early on fell slightly behind. The views, however would soon improve by a grand margin. We finally came upon the descent into Potato Hollow and it was a very obvious downhill. Oddly enough the descent was probably the least scenic part of the whole traverse as things looked pretty mundane and the trail itself had the feel of an unkempt, dirt-based industrial road. Down in Potato Hollow the views quickly improved and the temps also warmed up on us. Once again we enjoyed the meadow-like nature and the increasing amounts of Aspens. As we made it to the lower east end of the Hollow I knew from the map that the spring was in this area, but I didn't know exactly where. We came to the sign for Site #8 and the sign even had "Potato Hollow" on it, but no mention of the spring like we had seen at Wildcat. This left us perplexed as we didn't know whether to follow the small trail out to Site 8 hoping to also see the spring or whether to move onward. We went with the latter. 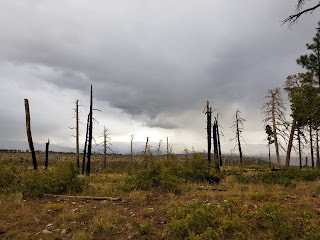 We followed the trail through more beautiful aspens and passed the sign for Site 7 but still no spring. 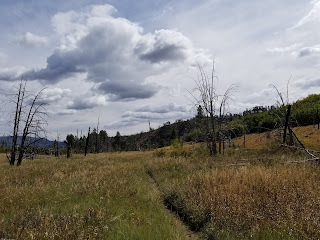 We followed the trail into thicker trees where the ascent began out of Potato Hollow and decided we must have missed the spring. The only logical place to start looking was back at Site 8. We all dropped packs where we were and I volunteered to run on back to Site 8 to look for the spring. I asked Matt if he would head up trail just a short bit to make sure it wasn't that direction. We had two FRS radios along and divided them up. This video, like the previous one for Wildcat Spring, shows the approach to Potato Hollow Spring. We had hoped before the trip the springs would be relatively straightforward to find. For Wildcat Spring it was. We would find later, that the West Rim (Cabin) Spring was also fairly straightforward. Potato Hollow not so much. Its definitely worth doing your homework ahead of time so you know what to expect with each of the springs and whether you can count on them in your water plans. I carried my water gear along with me in case I did get lucky. I made my way back to the Site 8 sign and then followed this side trail for awhile. I did finally come across a trickle of water just off trail in an almost marshy spot. It wasn't much but it was the first water we had seen since the morning. 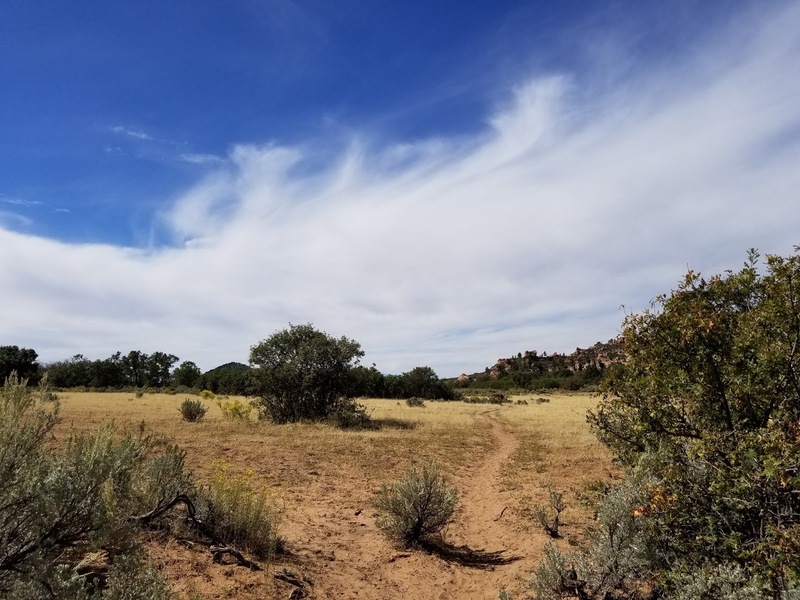 I followed the trail further just to make sure and I came across Site 8, and even followed a use trail heading further east from the Site but found nothing more. I headed back to the trickle resolving that had to be Potato Hollow Spring. I radio-ed Matt and Ken and Matt came on down so the two of us could filter the water we needed for the evening. 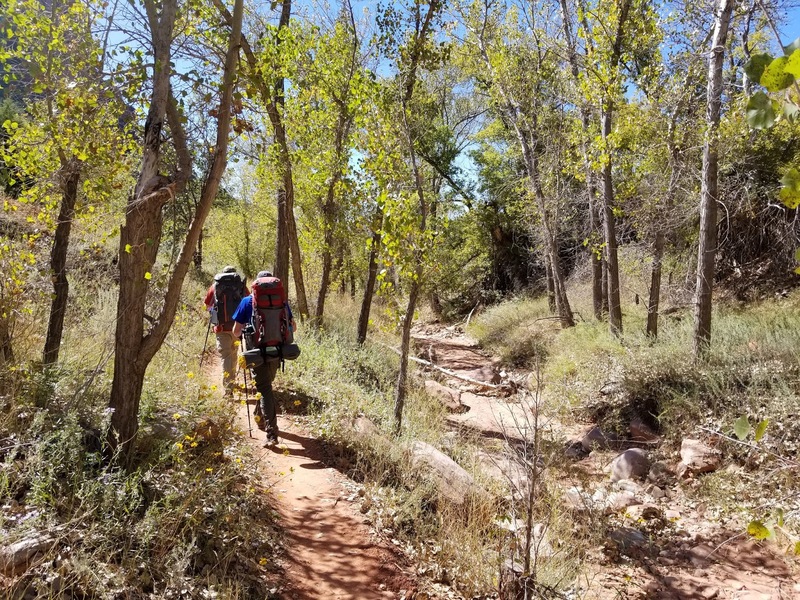 This whole adventure took up over a half hour but eventually we were able to get the water we needed, we rejoined Ken with the big packs and began our hike uphill out of Potato Hollow. This is a very difficult climb with big packs. In just about a half mile we went up near 500 feet. That's close to the same ratio we often hike on 14ers going all the way to a mountain summit, with daypacks! We took our time hoping this would be our last big climb of the day (though we would soon be disappointed). 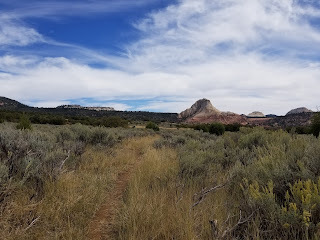 Again in this stretch of trail we had moments where it felt like we were back in the Midwest hiking with the given vegetation and trail structure. In fact, there were parts with the short grassy/weedy vegetation and the fall colors on trees I could have sworn I was on my beloved Poto Trail in Michigan. The trail finally crested out and we were rewarded with beautiful views, particularly to the southwest where we could see mesas with the typical white and orange-red stripes of the Zion area. We were also quickly greeted with a descent which made the legs and cardio a bit happier. The descent kept us in frequent view of all the open land to our west. In this area we saw in the trail increasing amounts of white chalky rock. This was especially true when we bottom out at a saddle having just dropped 250 feet from our previous crest. We knew what this meant for us, another climb. 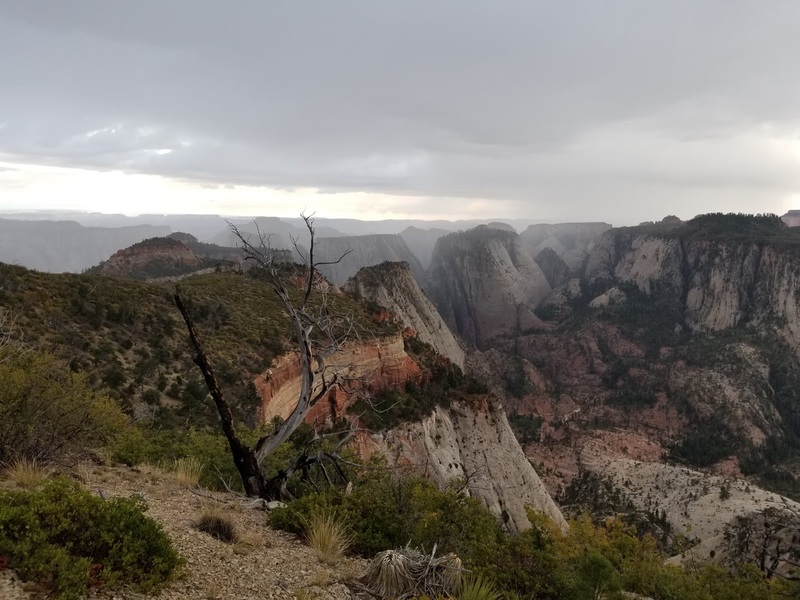 We could see it ahead of us on a narrow rib that regained the height of the West Rim area. Another 350 feet upwards to go and once more we were slowly but surely hauling our big packs up the hill. Thankfully, this would be for the last time. 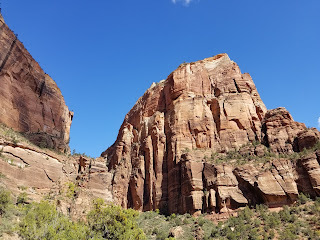 This time, we knew it would pretty much be all downhill now to Zion Canyon. As we topped that climb out we were immediately at the junction with the Telephone Canyon trail. It also started to sprinkle. 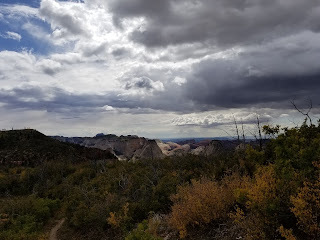 We could tell the clouds were closing in and could see rain falling miles away in various directions, but it was all scattered. We also knew of this possibility from the forecasts. As we followed the trail, now mostly flat, out to the edge of the west rim the sprinkles persisted but never grew strong. The views to the west were continuous and beautiful as we made our way south, eventually the sprinkles died out and left us with a heavy cloud cover. We began to sense we were drawing close. 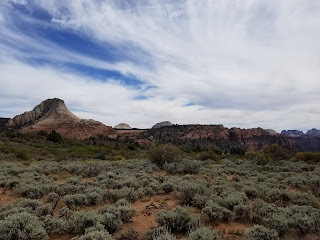 We passed a few of the campsites along the rim and enjoyed the mostly flat terrain and very short vegetation. There was again evidence of forest fires in the past couple decades. The trail eventually made its turn east at the south end of this plateau and we began the watch for Site 4. I had hoped it might be out on the southwest end of this plateau in an open area but it turn out it was on the north side of the trail, slightly "inland". Site 4 was a nice one with several different areas to pitch a tent and a few trees, though not many for cover. We found a great "kitchen" area with a number of rocks already in place. With the clouds as ominous as we were we quickly set about getting the tent up and this was a good thing. We finished setting camp, I situated my gear and then decided to make a bathroom run. As I was out on that bathroom stop we heard a loud thunderclap and saw lightning. I quickly hurried back to camp to find it had started raining. Not real heavy, but enough we'd want everything covered up. Temps were also falling. We retreated into the tent and wondered how our supper plans would work out. Luckily it was just after 4p when we had arrived at camp, and as the showers fell it wasn't 5p yet so we did have some time til dark. The shower lasted about 15 minutes and then I headed back outside. I decided to explore a bit with the time we had. 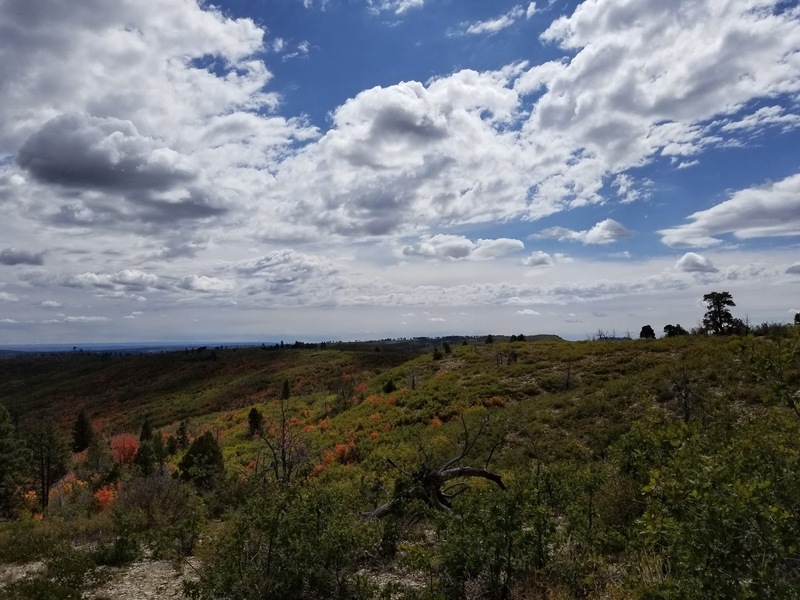 I ventured out to the southwest corner of the plateau and walked along the rim looking for the best views. It wasn't an abrupt cliff and so there was some slope around me to actually descend if I wanted. I spent about 20 minutes taking in different views and then headed back to camp. When I returned we decided to give supper a go. It was impossible to know if the rains would start up again or stay away. It drizzled some as we cooked but we gutted it out knowing we really didn't have much choice. Tonight we had chicken teriyaki and lasagna. The teriyaki has a handful of ingredients that I don't usually care for, but I have to confess when its nice and hot and you're standing there cold, I didn't notice those flavors and enjoyed the slight bit of sweetness that entree offered. As we really began to chill we found ourselves in the tent quickly after supper, it wasn't even 7p yet. I worked on reading awhile and then even lay in my bag watching Rogue One (Star Wars) til almost 9:30p. I didn't bring earphones (which would have been smart) but I kept it real quiet in the edge of my sleeping bag. 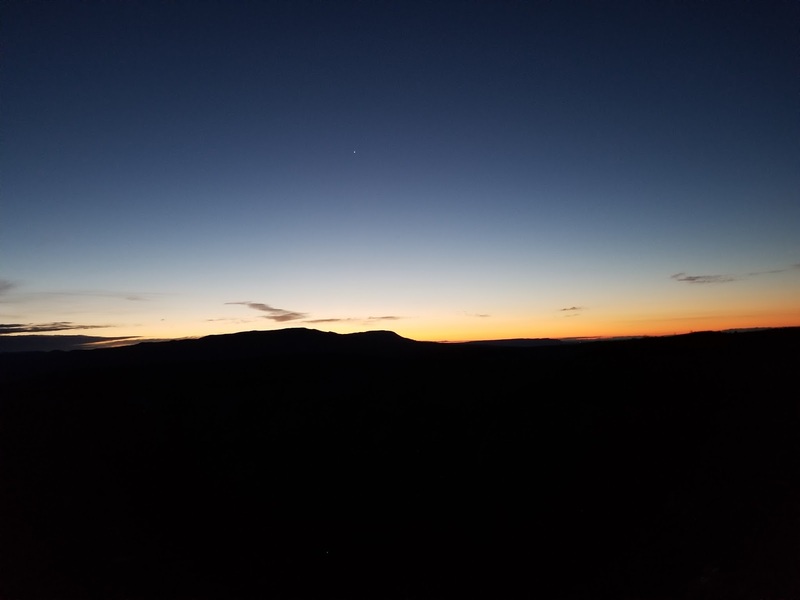 Last night we had this audacious idea of getting up before sunrise today to get an early start on our final day of the Traverse. We had this thought of getting down to Angel's Landing plenty early and hopefully beating some of the crowds. It wasn't too crazy early as we also didn't want to hike a lengthy amount of time in the dark. Its reasonably do-able, especially with headlamps, but you also miss out on a lot of good scenery. So we got up at 5:30a, we didn't even heat water at camp, we got tent and all packed up and we made ready to hit the trail. We were fortunate that despite the prior evening's showers the tent was mostly dry. 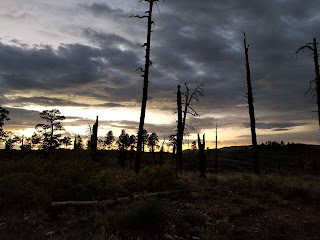 It was 6:17a when we finally got out of camp and hit the trail with lamps ablazing. This first section was all downhill and mostly stayed near the rim of the canyon. Had we not been in the dark we would have had some interesting views of the beautiful terrain to the south. With sunrise coming at 7:24am we were getting enough twilight just before 7 that we started turning lamps off. This was about the same time we started the descent down to the Cabin Spring junction. We could see headlamps at Site 1 down below us but we never actually ran into the people. 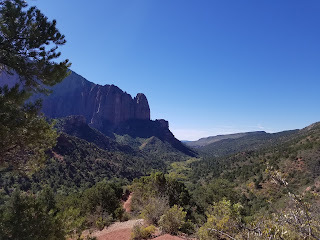 With a couple of switchbacks we found ourselves down at a massive trail junction with a view. 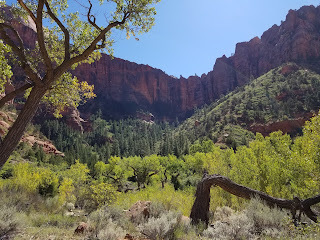 I understand that we were seeing most of Telephone canyon and also the eastern walls of Zion Canyon around where the path to the Narrows begins. We felt we were making good time, it was 7:05am, and we were also a bit hungry. So we dropped packs, pulled out the stove and heated a quick pot of water. While the guys ate I followed the sign for Cabin Spring and walked a 1/10 of a mile on its trail to find a messy wet area. I was glad we weren't relying on using that spring as it would have been interesting to find a good bit of clean water. I could see a dripping source and it all looked like a small marsh. At the big junction where we had stopped, not only did the main West Rim Trail meet there, and the Cabin Spring spin-off, but the Telephone Canyon trail also came in there as well as the side trail to Camp Site 2. It was a big junction. We didn't know if that little area had a name, but given our usage of it we dubbed it "Breakfast Point". We even watched the official sunrise over the horizon from there and captured what photos we could. The descent from that point down into Telephone Canyon is a marvel of engineering. We followed two sweeping switchbacks down what almost amounts to a cliff face. There was crazy exposure off the side of the trail, but it was wide and it was paved. The trail may have easily been 8 foot wide, so plenty of space to move without leaning over the abyss. 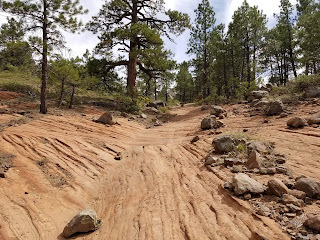 We carefully trodded downhill through the switchbacks and at the end of the switchback the trail kinda rounded the corner in the back corner of the canyon and then eased into the bottom of the canyon on dirt and trees. Exposure area done. I've always marveled at how on hikes like this, particularly with a big pack, the exposure grabs my full attention and I'm not without a few nerves. Yet I've also worked my way through class 3 and 4 terrain on dangerous peaks in Colorado where the situation was far more on the edge. There is something about how the mind adjusts and works out a certain comfort level to each situation that intrigues me. When I know I'm going to have to deal with high exposure I work up to it. But on a hike like this, where I'm there to backpack and not climb, I think the mind doesn't adjust up to it as much and so the nerves are ever present. At the base of the canyon we hiked through mixed trees and a small slot area with evidence of flooding. When the terrain opened up more we were surrounded by beautiful canyon walls and you felt like you could just take pictures continuously as it all looked so amazing. The trail was mostly flat with just a bit of descent to it. We went through a few sections of rock slabs along the way, but no route-finding questions at all. I was eating up my morning snacks through here which would just about empty out my food supply. The trail eventually bottomed us out at a foot-bridge which then led into 4 switchbacks, all paved, which climbed steadily to gain a ridge. When you've been descending all morning, it really catches the cardio for a loop when all of a sudden you're going up hill and at a rather steep clip. Even as the trail gained the small ridge it continued to ascend on the ridge. 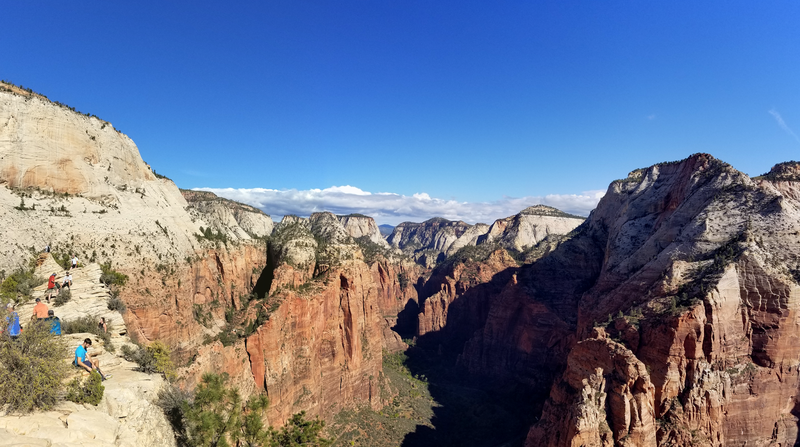 This ridge was essentially part of the western walls of Zion Canyon as once we topped out on the ridge we had complete views of Angels Landing and Zion Canyon. 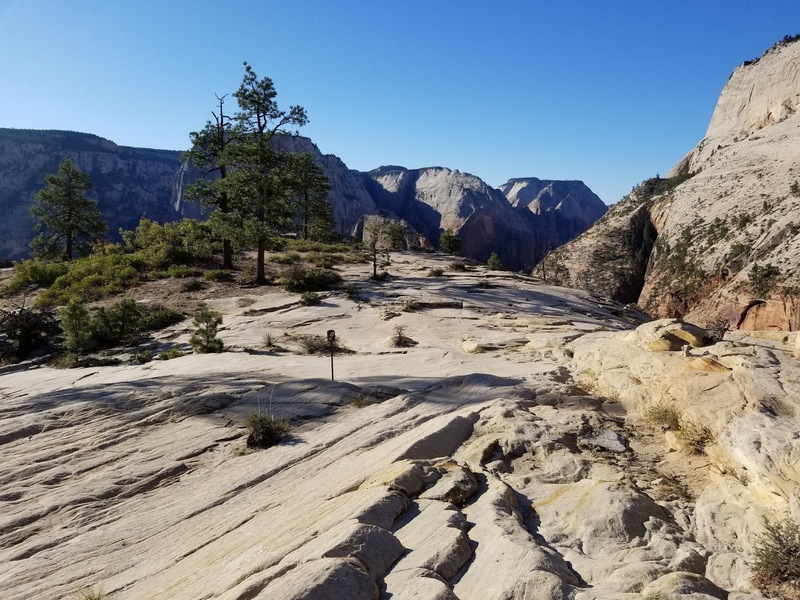 Its always an eye opened when you get your first glance at Angels Landing and its summit ridge. It looks steep, it looks narrow, and it looks crazy for humans to think of going up there. 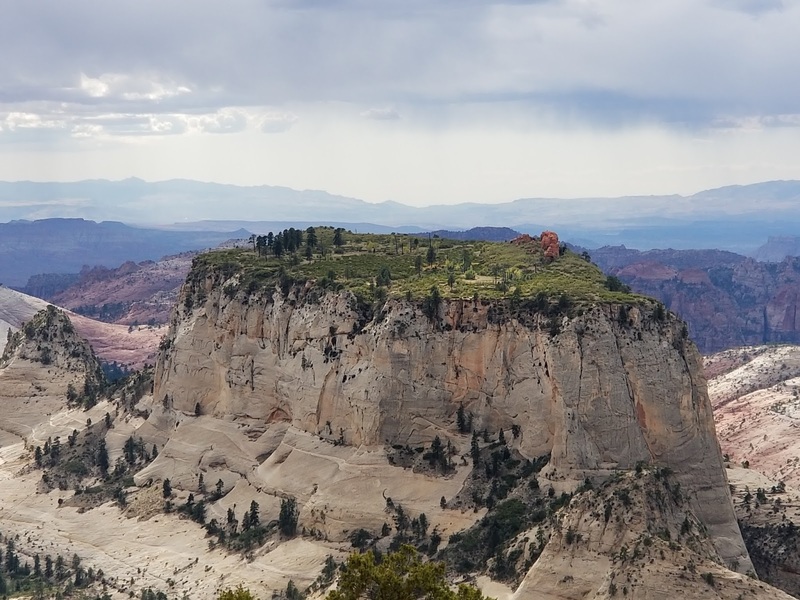 And to make matters worse, off the sides of that narrow ridge are vertical walls of rock. We stopped at an open, flat, smooth rock area with pretty great panoramic views and grabbed some photos and evaluated our position. 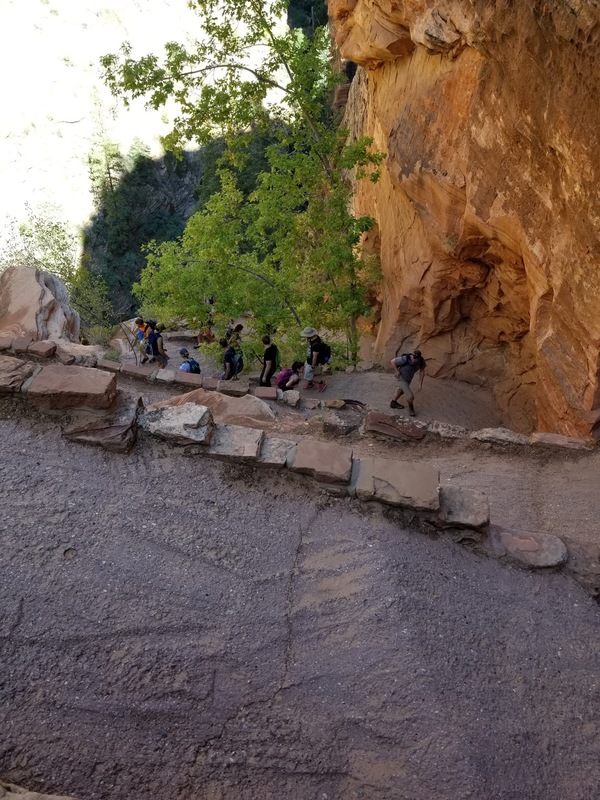 It was around 9:30 and much to our disappointment we could see plenty of people already heading up Angels Landing. We were early, but not nearly early enough from the looks of it. A number of switchbacks and a little more trail and we were down to Scout's Lookout which is the base for Angel's Landing. Some of that area descending was very reminiscent of the subdome approach to Half Dome in Yosemite. At Scout's Lookout there was a lot of people. There were pit toilets there which was handy for the crowds. We continued our debate of what to do with our big packs while we hiked up Angel's Landing. It was quite evident you don't want 40 pound packs up there. We settled on setting our big packs back to back in the middle of sandy area near the bathrooms where people were passing through frequently. Our main concern wasn't so much people messing around and possibly stealing something, it was about the numerous chipmunks we sighted trying to chew their way in. 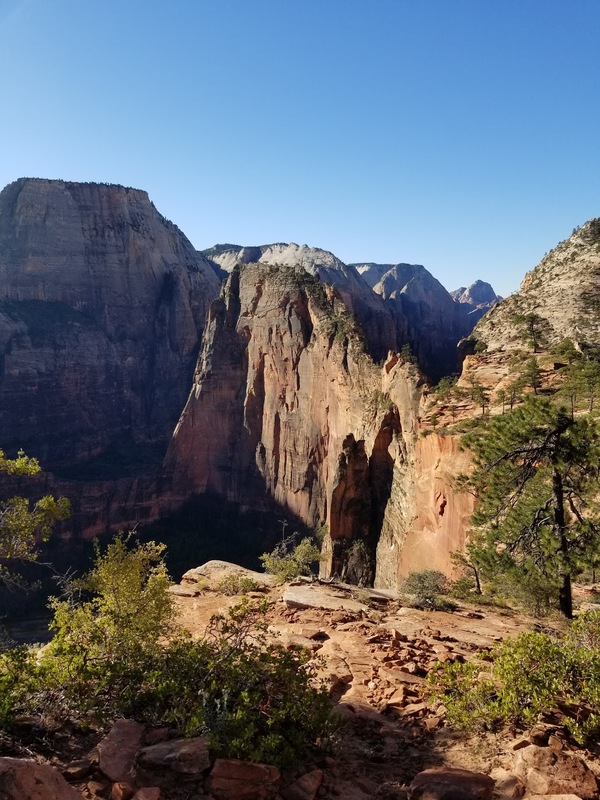 We finally opted to carry the top pouches of our backpacks with any remaining food and food trash with us up Angel's Landing. My Osprey Aether has one that detaches easily and also has a hip belt so I decided to wear it. This also afforded us a means of carrying water as well. 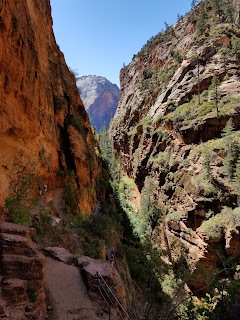 Once we had our gear set, I got my GoPro camera on my headmount and we made our way along the very brief trail to the base of the Angel's Landing climb and prepared to head up. We didn't even bother to try to count the number of people around. It wasn't a full blown ant trail, but there was enough people to get bunched up in places and be an impediment to the hiking. I didn't recall it being this way when I was there in 2009. I recall having been able to make my own pace and climb mostly at will. Not so today. The start of the climb begins on a steep slightly exposed face where there are chain rails already in place to give one a place to hang on. This would strangely be one of the most difficult parts of the whole climb. After an initial bit of climbing the ascent levels out and moves laterally to a saddle and a catwalk before beginning the bigger climb. There was plenty of exposure nearby at nearly every part of the ascent. This is definitely not for the faint of heart. Frankly, I'm still amazed how many people ultimately complete the ascent without accident. There are no single elements that are overly technically difficult, but with all of the exposure there are areas with little room for error. The mode of climbing was to use openings between people to make progress until oncoming traffic was met, and then either the ascenders or descenders had to wait for a group, or multiple groups, to pass. Its hard to explain the individual elements of this climb but to solve that I have shared my entire GoPro video of the ascent. We topped out after a 45 minute ascent from the Scouts Lookout area. It was a beautiful day to be on top and temps were very nice to us. I was also looking forward to the summit as this would be a chance to get back into cell signal. Matt and I knew the Cubs had played the Cardinals the last 3 days and almost certainly during one of those days they would have moved their magic number to zero to clinch the NL Central. Indeed we discovered they had. What sweet wonder to clinch at Busch Stadium in front of all those jealous Cardinals fans. And for us to learn the good news atop a beautiful place like Angels Landing, made us smile. We took a bunch of pictures and enjoyed some snacks atop the Landing, but only remained about 15 minutes. As it often is on the summit of difficult 14ers, knowing a potentially dangerous descent lies ahead never leaves one's mind. We were curious just how difficult, mentally and physically the down half would be. 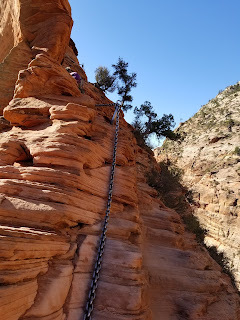 We took our time on the first few sections, hanging tight onto the chains and patiently waiting for opportunities to move past groups on their way up. Things were going very smoothly for us on the descent and we were pleased it wasn't quite the mental or physical challenge that had concerned us. In some cases as we descended there were bunches of 20 people waiting to come up. We think we still beat some of the largest crowds and were glad to be on the way down. In the final section, which is arguably the most difficult, there was a bottleneck of people both ahead of us descending and waiting to ascend. It was taking people time to move through that steeper rock. We made it back to Scouts Lookout after a 43 minute descent, hardly faster than the ascent. The traffic undoubtedly had something to do with it. We made our way back to our big backpacks and were pleased to see they were still untouched. We spent a few minutes getting everything situated and then hit the trail down. It isn't long on the descent til you get into Walter's Wiggles. 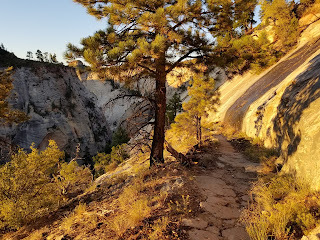 A series of switchbacks only 40 foot or so long very carefully winding down a steep rock face into Refrigerator Canyon. There were numerous dayhikers still ascending in here. It was interesting how every so often you'd here someone make a hoot or holler sound to hear the echoing of the narrow canyon. It was nice to have the slightly cooler temps in the canyon (hence the name) and to be out of the sunlight. After the wiggles the trail mostly flattens out to make its way the rest of the way out of the canyon. After crossing a foot bridge the trail pokes back out into the open, almost on a cliff. In fact, the next section of descent is basically carved into the side of the rock face and then switches back narrowly to drop elevation. 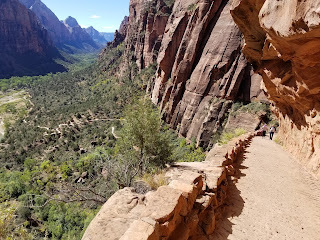 All of this was paved as was a good portion of today's trail (minus Angel's Landing). After a number of switchbacks the trail begins to straighten out one last time to make the final push out to the bridge over the Virgin River and then the Grotto Trailhead. We were eyeing a number of the river access points with a strong desire to take off shoes and socks and wade on in, but we waited. It was 12:30p when we finally made it back to the bus stop and finished our Western Traverse of Zion. There was much happiness in our group and a great sense of accomplishment. Undoubtedly many people can and have completed this hike. We had put in 45 miles or so and several thousand feet of ups and downs through absolutely gorgeous terrain. Everything had pretty much gone on without a hitch. I know some folks like crazy unexpected advantage, even some danger, but for me there is great fulfillment in putting in hours of planning and thinking through all conceivable issues, and then seeing that work come to fruition with a great trip. And that's what we had. 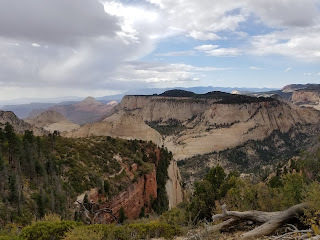 We did give some thought as an add-on to return the next day and dayhike the East Rim Trail so that we could complete the full Zion Traverse, but we ultimately decided that wasn't in the cards. It would have involved working out another shuttle and putting in another full day's worth of 12 miles or so, but it was ever so tempting. We spent time at camp in the evening thinking up where our next adventure might take us. 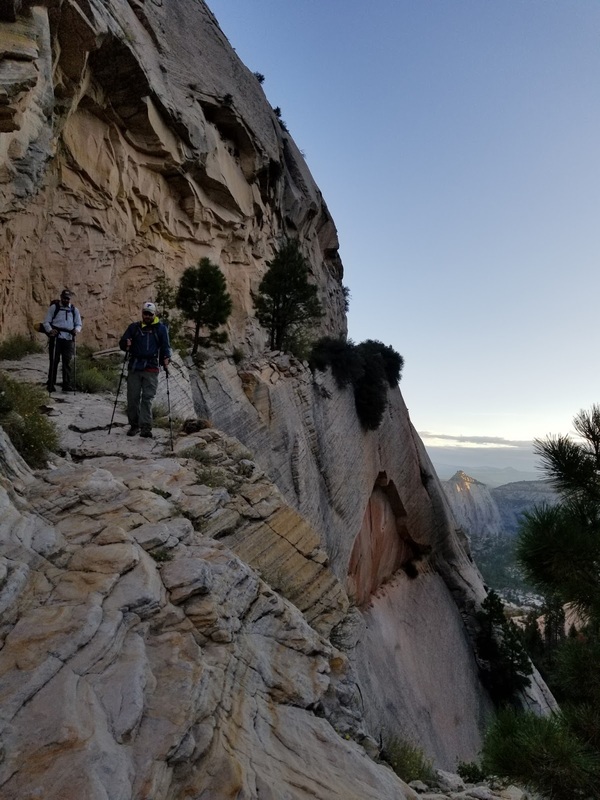 With two tours in Yosemite and now a wonderful traverse of Zion, we were confident another grand adventure would present itself. 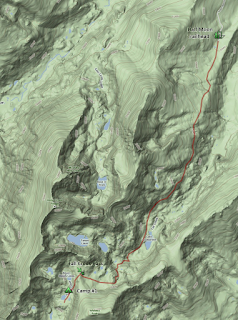 The Teton Traverse? Grand Canyon R3? New England's Presidential Traverse? Colorado Anything? Time will tell.